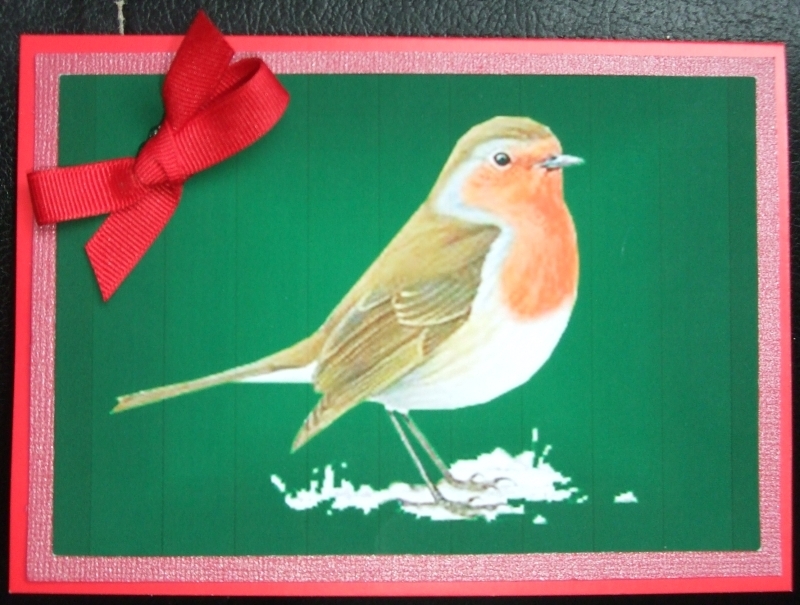 I’ve got six cards finished the end of this week to show you. 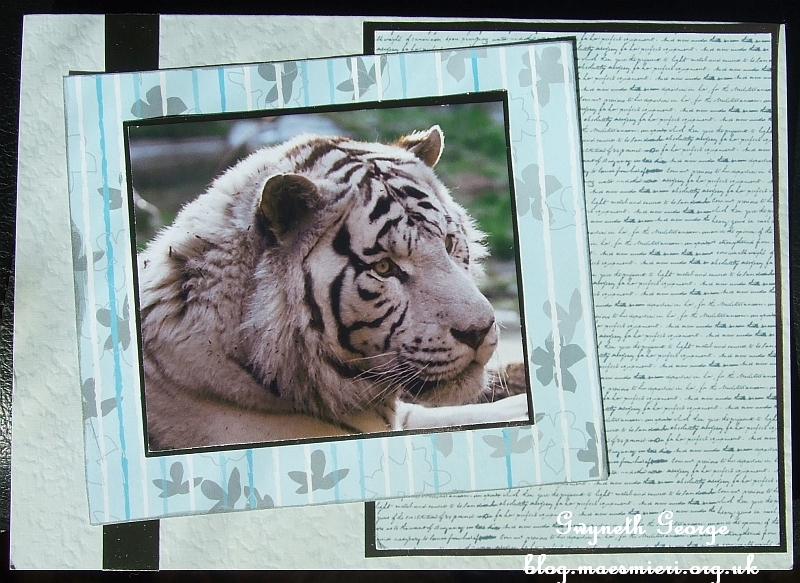 It includes a card with a tiger on for a man, a couple very different Christmas cards, a sympathy card, a floral card, and one with a butterfly. Quite an assortment I think you’ll agree. Please scroll to the bottom to leave me a comment after you’ve browsed around my creations. Thank you. 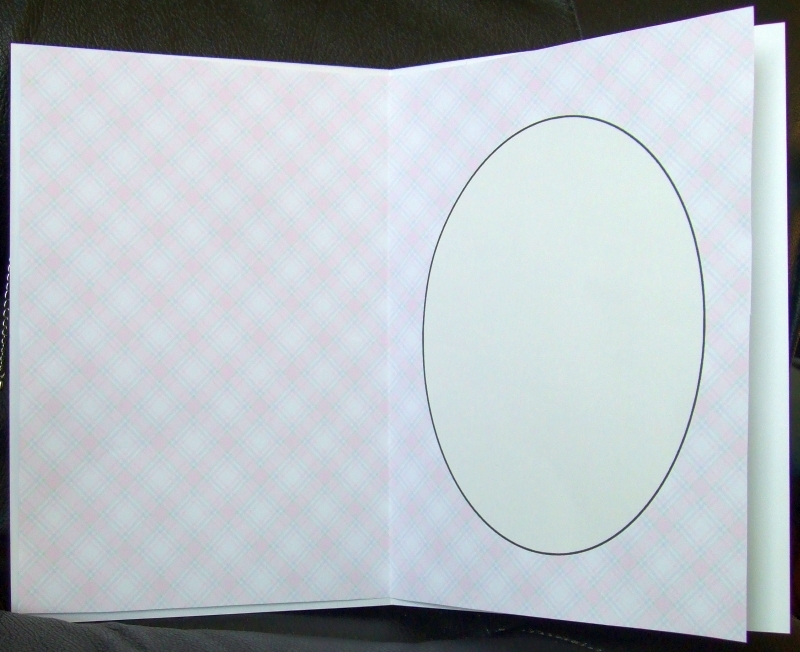 This picture shows the insert panel from the shame sheet placed inside the previous card. 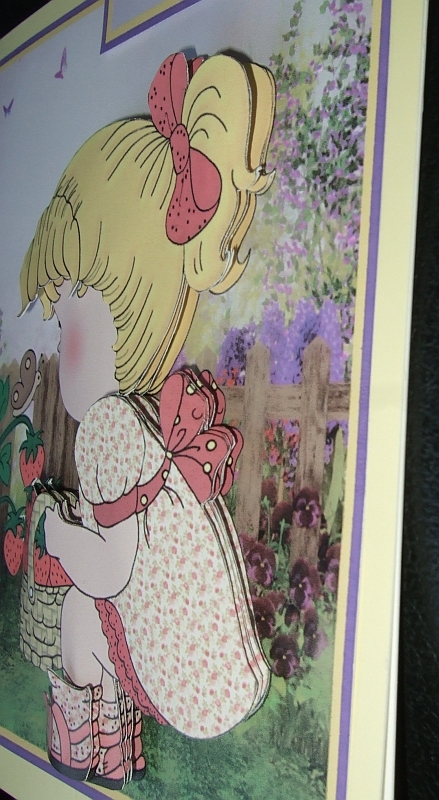 This is a closeup of the detail from the previous card. Friday, 26th April – Here! – The subject line in this mailer was “WOW! A New Friday Mailer Featuring The Latest HOT Designs, NEW Froms & FREE CD Content”, so basically it’s a showcase of what’s sold best lately, and some new batches of designs from a handful of designers – plus, of course, the Free CD-ROM you get if you spend £10 on items from craftsUprint. I have now passed the monumental total of 1,400 photos of handcrafted items, uploaded against the digital item I used to make them, on the craftsUprint website. 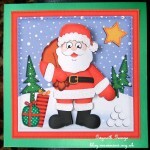 You can find them on my Crafter Showcase pages – Here! I only need to upload just under 600 more to hit the 2,000 uploads mark and be upgraded from a “Gold” to a “Platinum” Crafter. I don’t expect to make it this year, but it may be one of my aims for 2014 if I get a reasonable amount made this year. 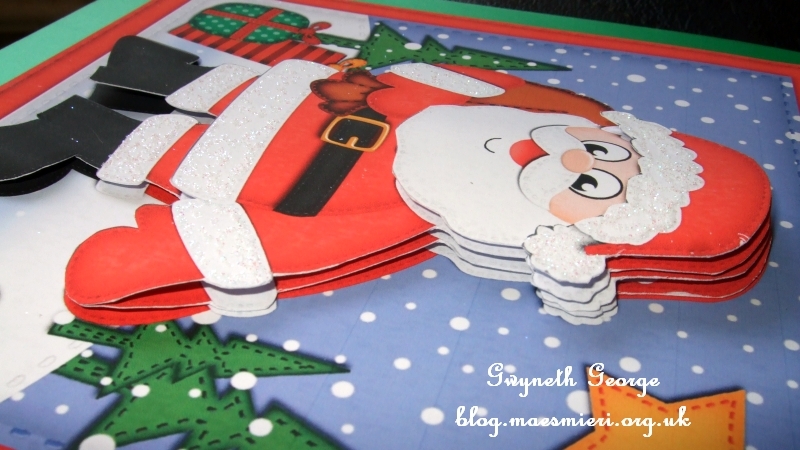 I’ve only got three cards to show you in this blog post, but I hope you like them. Unless you want to know what I used and how I made a card you don’t actually have to read all the information I provide in the numbered details under each card set, you can just click to view each card at a larger size, and then click “Back” and scroll down to the next section. 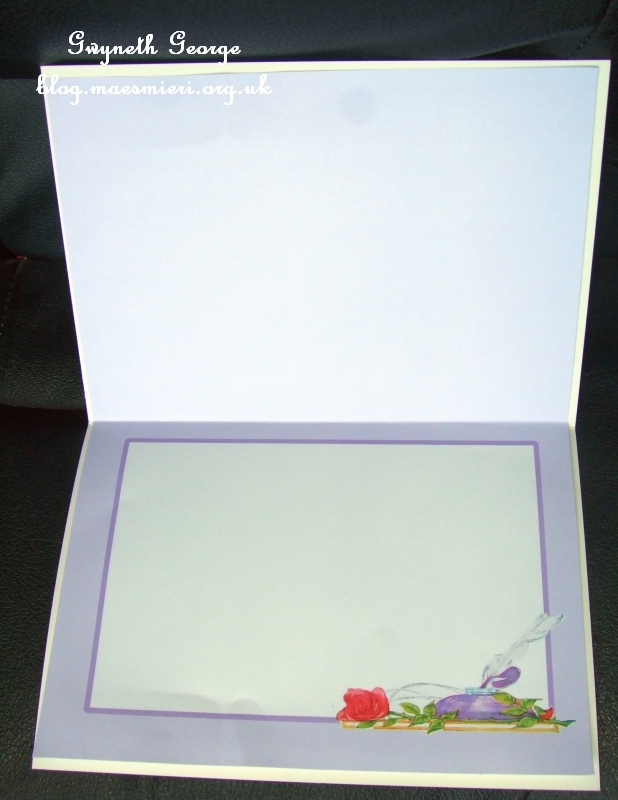 An angled closeup of card front to show the little dimension on the card. Crafty Bob Paper – NEWSFLASH! 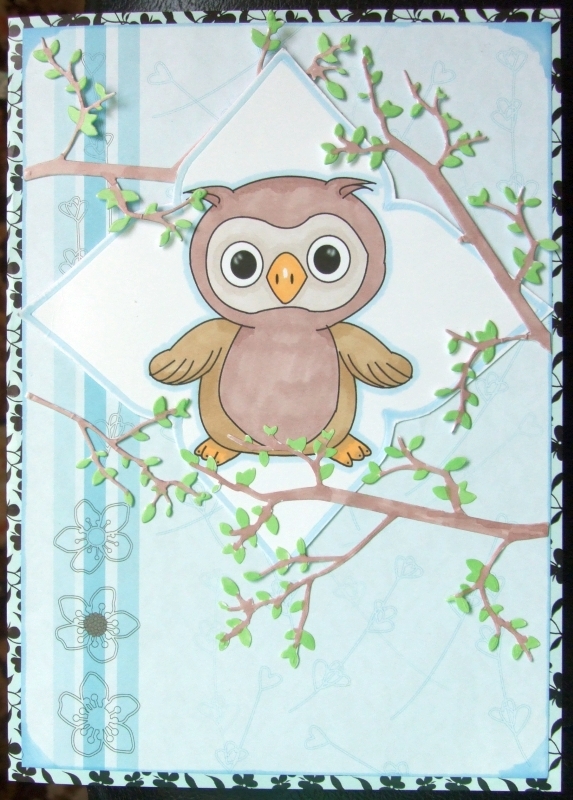 Crafty Bob Paper just £3.49 a pack! 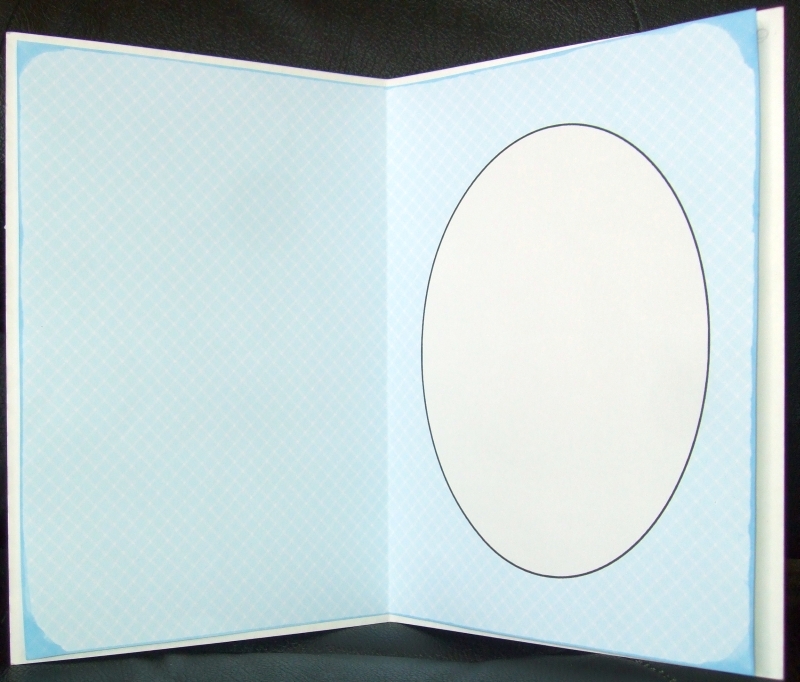 The Crafty Bob Merchandise section on craftsUprint is growing, with large DL envelopes, 8″ x 8″ cards and envelopes, etc., added lately. Currently there’s a big discount on several different types of Crafty Bob Paper – which can be shipped around the world. To have a look at what’s available click – Here! – and scroll down a bit for the paper. “New CUP Monday, Wednesday and Friday Mailers! You will have noticed that our mailers are changing. 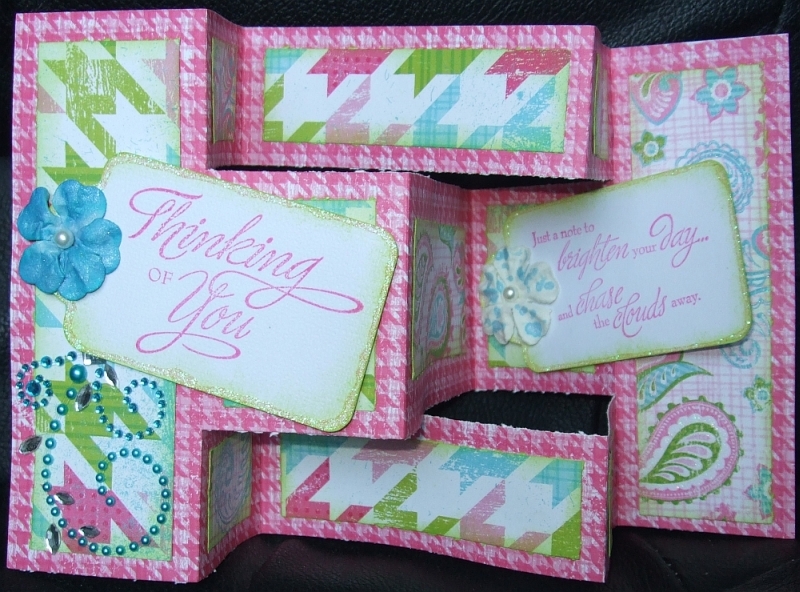 Monday Mailers will now promote all Designers in weekly top selling order. There are now numerous pages for you to click through to and these will be numbered for easy use. Page 1, Page 2, Page 3 and so on. 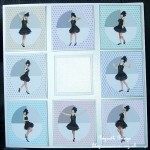 Simply click on a page to see more fantastic designs. Wednesday Mailers are all about Community News & CUP TV Episodes. Friday Mailers will be jam packed full of our best selling designs and new from features so you can see whats hot and whats new. and also thank you to everybody who’s left comments on my previous blog posts. These two pictures were taken by my two little nephews after we came back from the Cymanfa Ganu (a singing festival where members of local chapels come together to sing) on Sunday Morning. 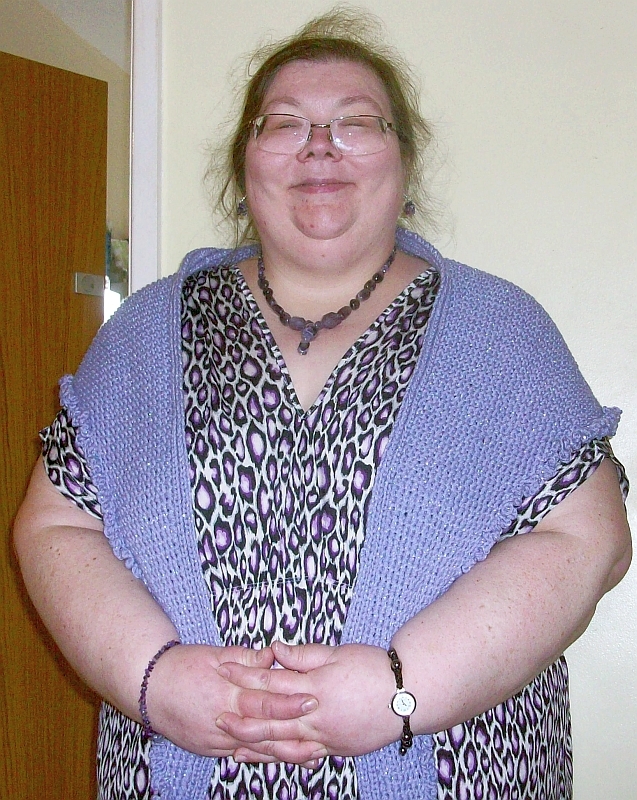 I’m wearing the amethyst jewellery I showed you in my last blog post, a watch that I showed you in my blog post of the 21st December 2012, and the wrap that I’ve got pictures of below in the Knitting section. One nephew wanted me to turn my head slightly as he wanted to see if he could get the earrings to show. Over the weekend one of my Facebook Friends was celebrating her 1st Blogaversary, and it got me to thinking – what was I crafting and writing about on my blog a year ago? So I went to have a look. The blog post I put online the closest to a year today was on the 24th April, 2012 – Here! – Wpps! 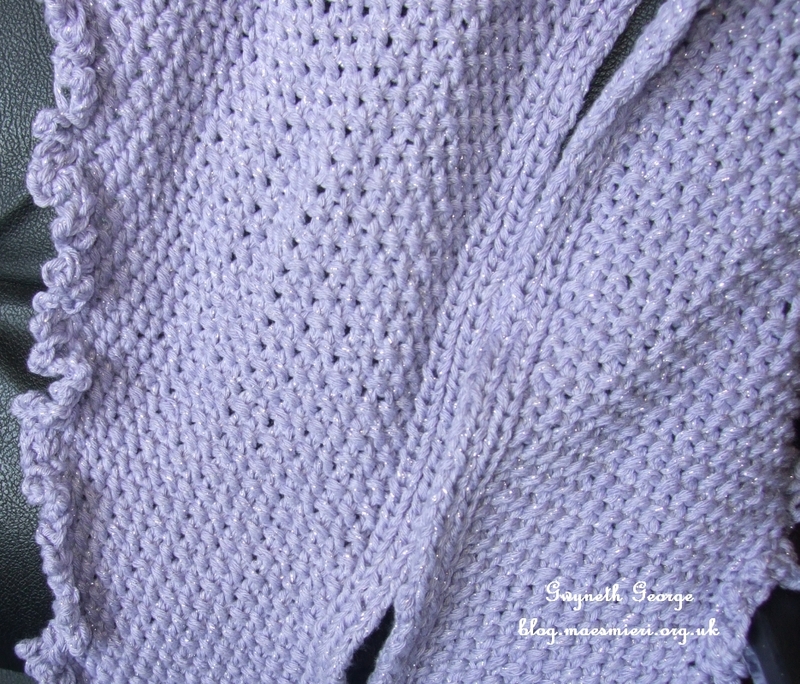 One of the items I mention, “white baby blanket knitted using tiddly pom yarn”, still isn’t finished. I’d put it away over Christmas so that we had a bit more room as I’m knitting it on my large Authentic Knitting Board, and since then I’ve been working on little projects for the nephews toys and my wrap, etc. I did pull the Knitting Board out this morning and knitted three rows – about my limit in one session. If I do a little at a time I’ll hopefully finish it this year – no point in setting myself a target before then that I know I won’t be able to meet. 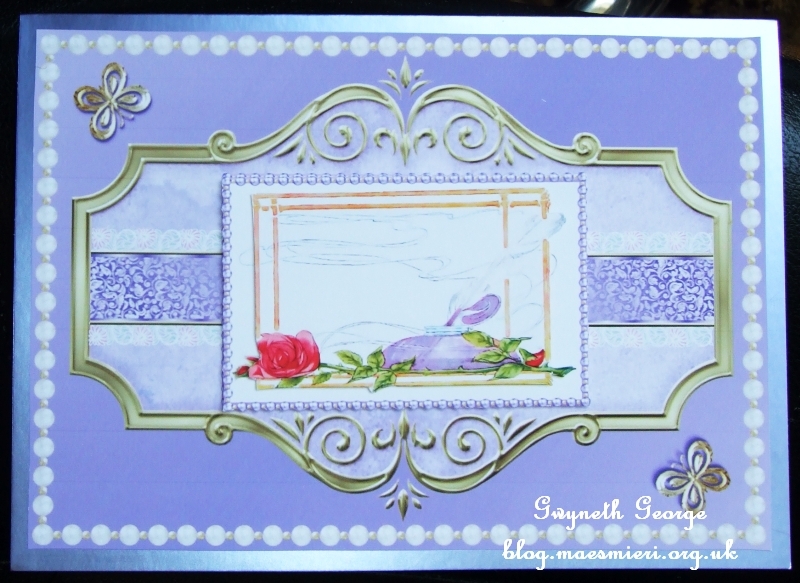 It seems that it was Easter two years ago when I made my blog post of the 24th April, 2011 – Here! Easter this year already feels a long time past already. 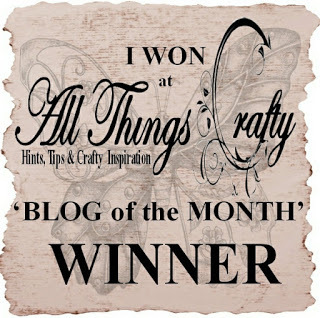 Yesterday I was notified that I’d won the “Blog of the Week” slot over on the “All Things Crafty” group on Facebook. 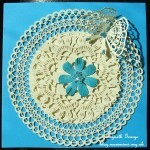 This is a group to post about our latest blog publications about “all things crafty”. Thank you for the honour! I’ve now put my badge in the sidebar on the left. I splashed out on an Inkadinkado cog stamping system during Create & Craft’s birthday event and it arrived quite quickly, so the nephew’s and I had a bit of fun on Friday testing some of the stamps and cogs out. I’m not a huge user of physical stamps, preferring to use digi-stamps, but for filling in a bit of background or having fun with the nephews this system is great. 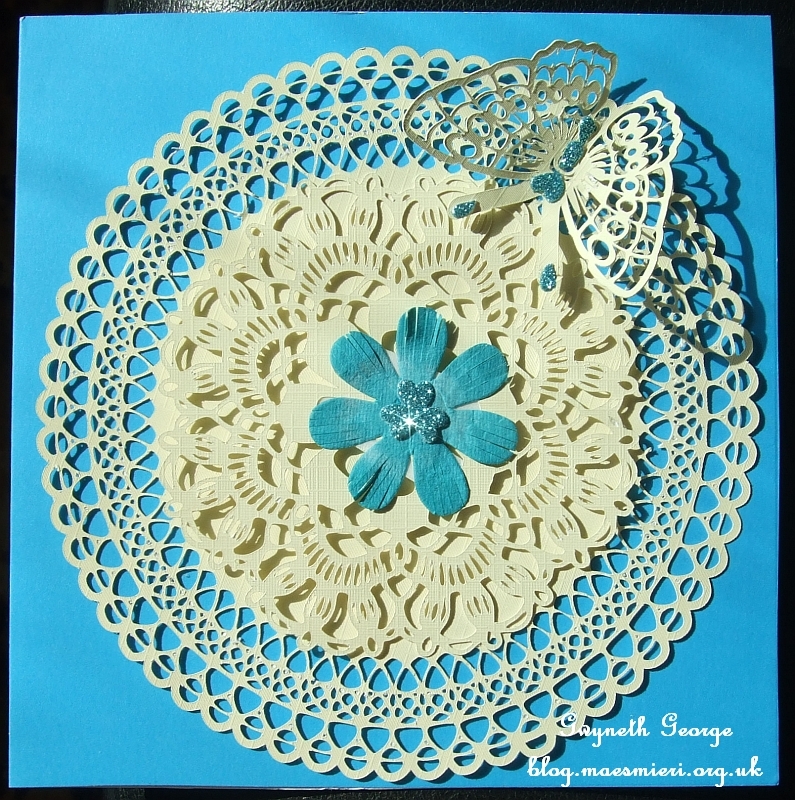 I’ve used one of the stamps with the square cog to make a background for one of the cards I’ve got to show you today. I hope you like what I’ve got to show you and will leave a comment to let me know you’ve called round and to let me know what you think. 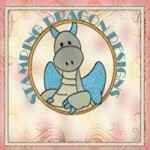 A new challenge has started for group members in the Facebook group “Stamping Dragon Designs“. It’s a colouring challenge where anybody who wants to take part requests a copy of the challenge digital stamp. 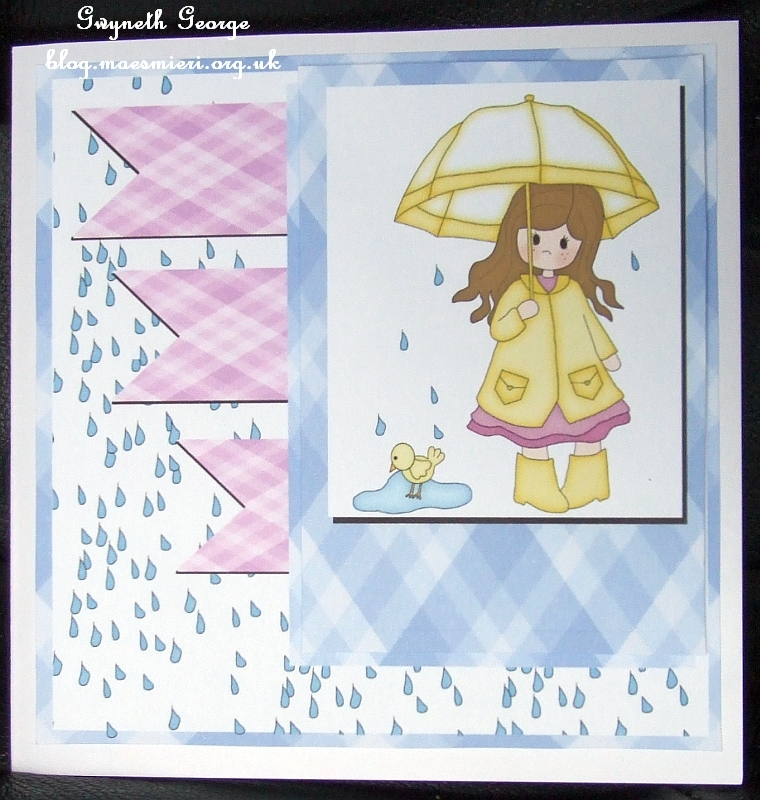 A project must be made using the coloured in digital stamp and uploaded to the challenge Event page. 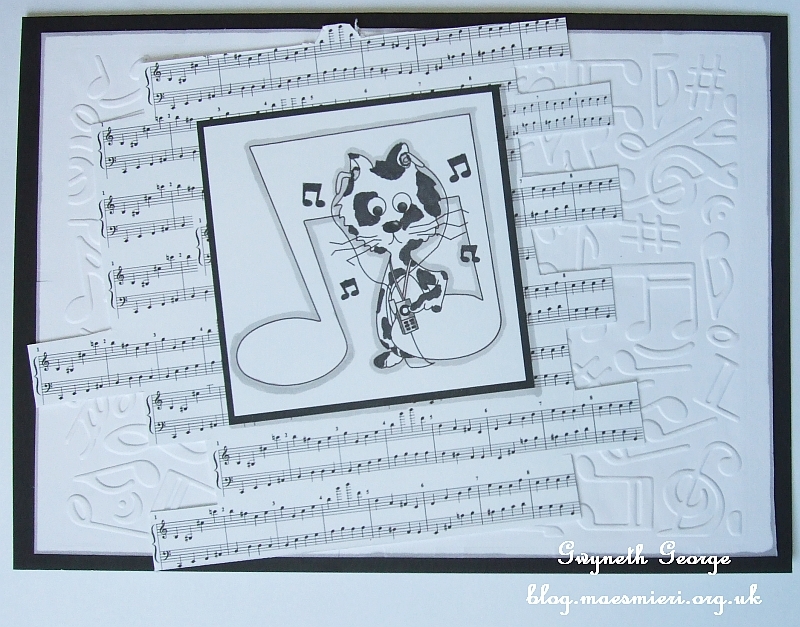 The image we are being supplied with this month is “iPod Kitty” by Janette Padley of Stamping Dragon Designs. 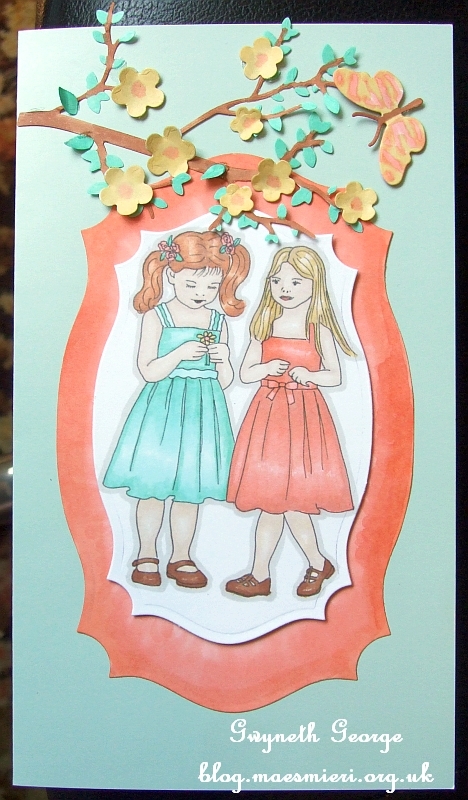 This is the card I uploaded earlier today. I printed the digi-stamp out at a smaller size than provided onto 300gsm Super Smooth white cardstock. I decided to go monochrome for this card – not something I do very often – and coloured the cat in as a black and white cat with a grey iPod. I used my ProMarkers to do the colouring. The colours I used were: cat and some musical notes – Black; iPod – Cool Grey 1, 3, and 5; shadows around cat and large note – Cool Grey 3. 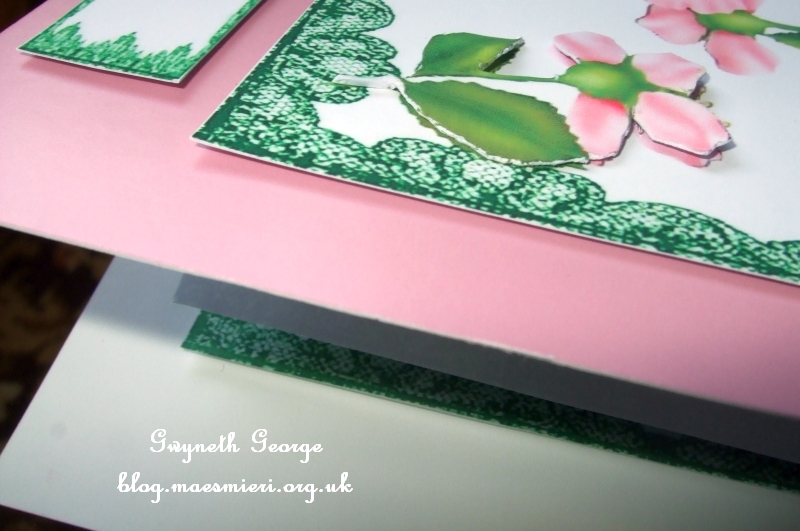 I also used the Cool Grey 3 around my base mat which I’d embossed with a music M-Bossabilities folder in my Joy Trouvaille embossing and die-cutting machine (I’ve found that using 2 of the Blue plates for the sandwich and the Joy embosses a 300gsm card-stock just fine in the Joy). 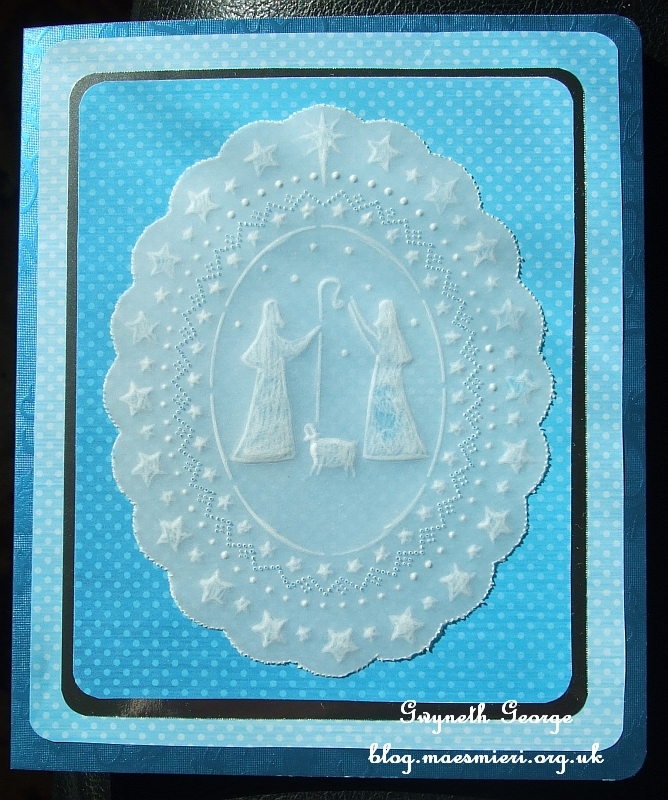 I used a music notation software to create a random piece of music score and then made several copies of it in My Craft Studio to create the quirky background that I placed behind the trimmed digi-stamp topper. 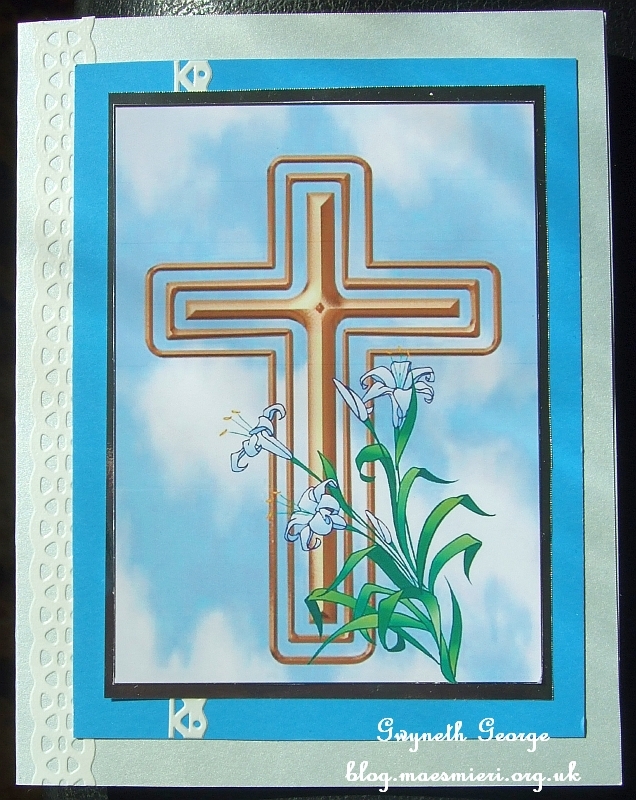 This was also printed out on the same cardstock as the topper. 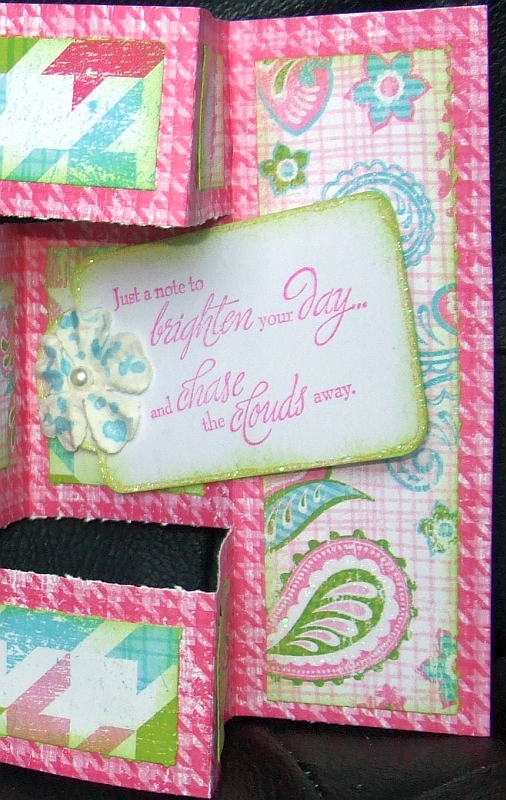 An angled closeup of the same card showing the slight dimension I’d created on the card. 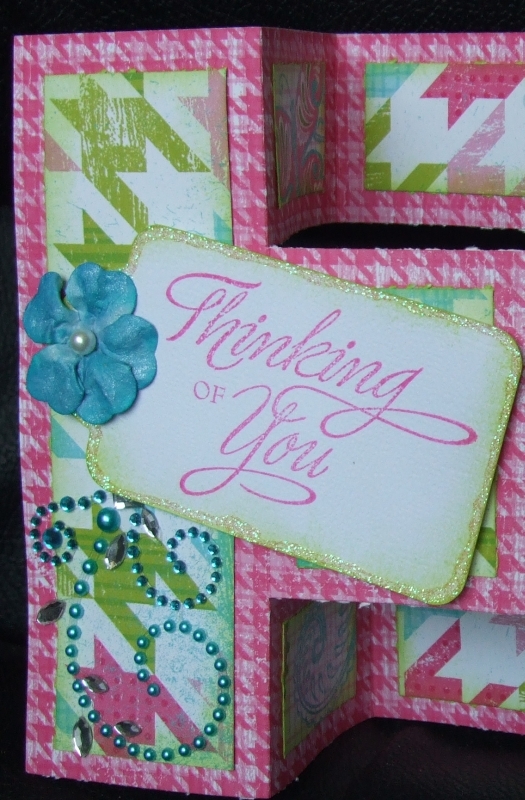 Angled closeup of the previous card to show layers and dimension. 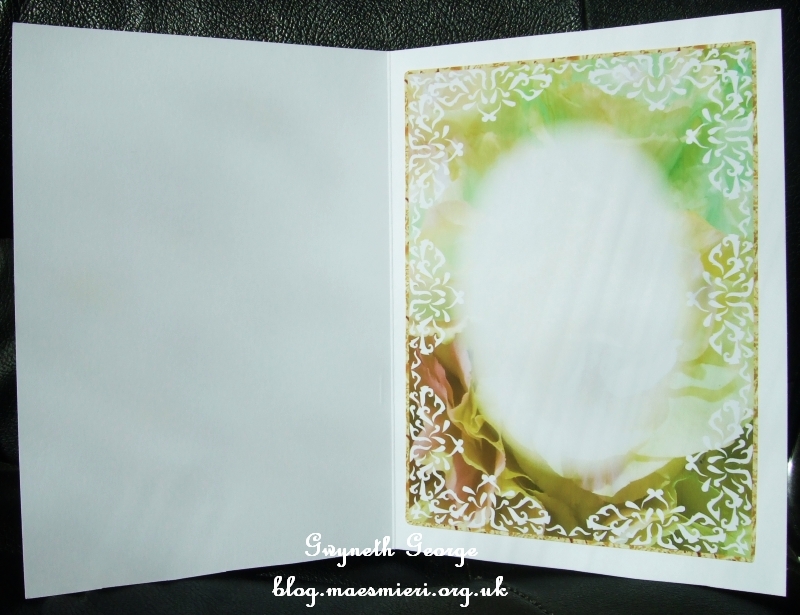 I’ve now finished the wrap I showed you the start of in my post of the 27th March – Here! I won’t bore you with the details of the yarn and knitting loom I used again because you can find those on my earlier blog post. 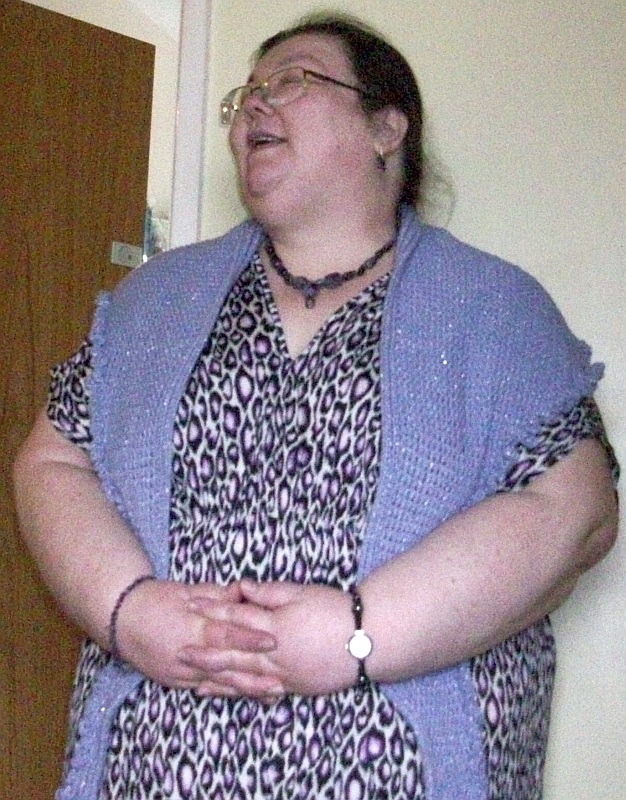 I knitted one side up first, then knitted the other side with the rib edge on the opposite side of my knitting. I then joined both sides together down the centre back to create the wrap. 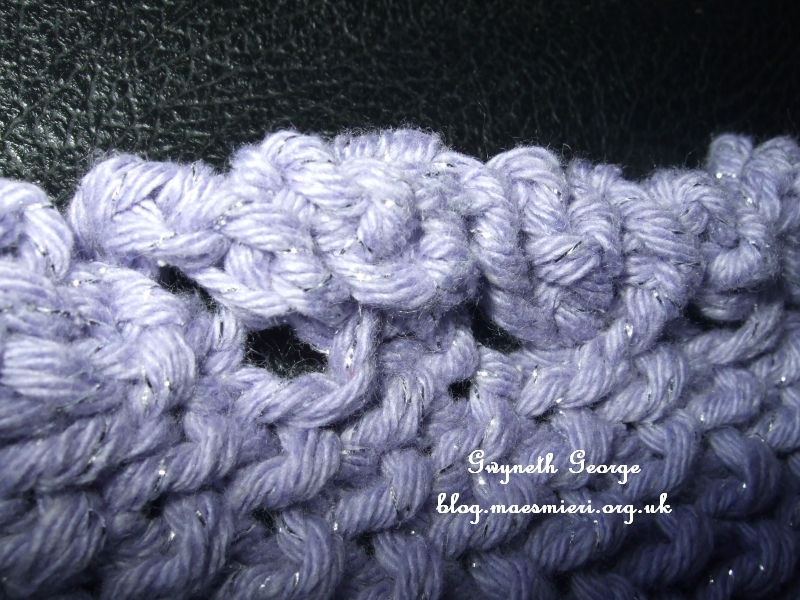 I finished the wrap off by crocheting a loop frill edge – I picked up a loop of knitting from the edge of the garment, and crocheted a stitch through to leave one new loop on the crochet hook, did a chain of four, then picked up another stitch from the garment edge, crocheted it through to leave one new loop on the hook and did a chain of four again. I carried on like that until I’d gone all the way around. Absolutely killing on my hands and arms as I had to do it in a few longer sessions than I’d usually do – because I wanted to ware it on Sunday. I really should have planned things better and not left so much to the last two days. This is a closer look at the effect of the moss stitch in the main body of the wrap. 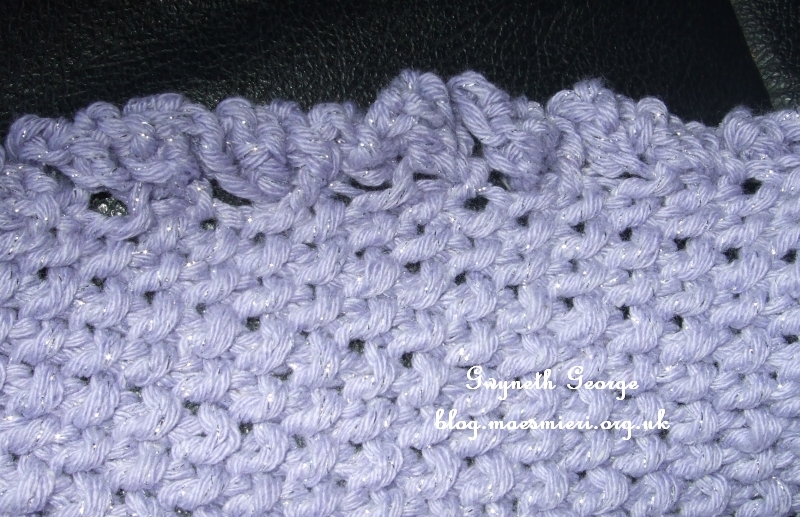 This shows the ruffled look created by crocheting around the edge. And a closer look at the edge. 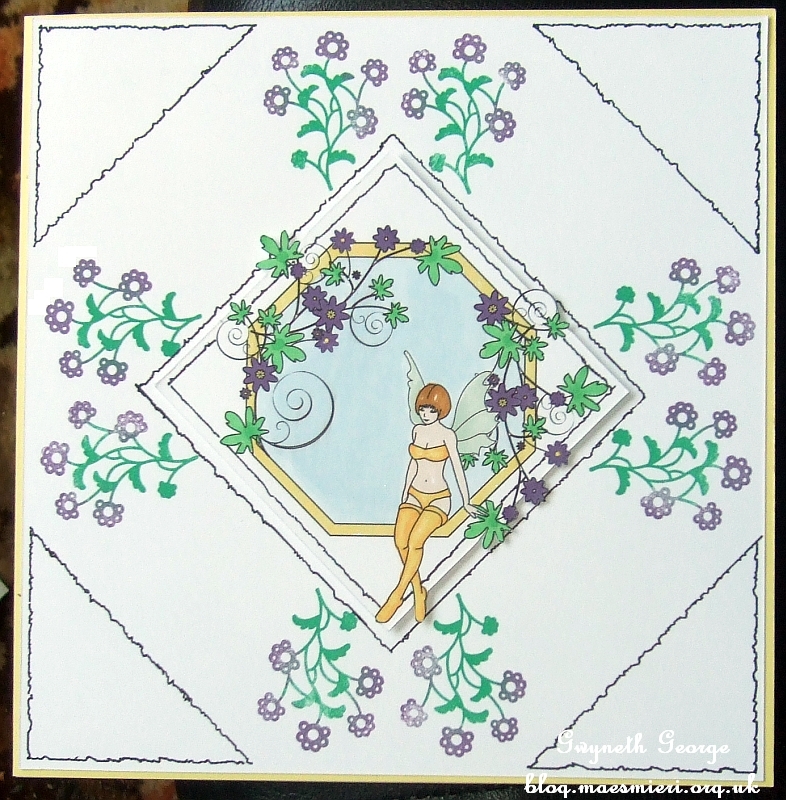 The Colouring In Digi Stamps page is now a section of pages with quite a bit with more information and a pictorial tutorial of how I achieve various effects when colouring in. I’ve got a few more sub-sections I’m working on but haven’t got anything new this week. There’s nothing new on my Making Paper Flowers page, but again there are a few different flower types I’d like to photograph before long and upload. 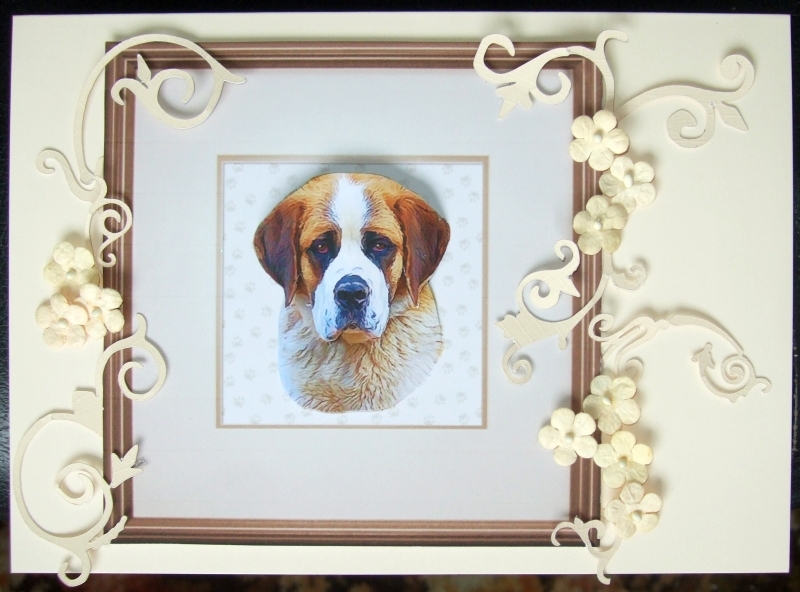 Have a look – here – at my whole shop ”Siop Crafftau MAES MIERI Crafts Shop” on craftybob.com. Friday, 19th April – Here! – The subject line of this mailer says that it contains “FREE Volume 42 CD, NEW FUN Paper Beads, CUP News & More!” so click over for a look. There’s even a “Cardmaker Spotlight where the card being shown has a recipe for “Choc chip Muffins” on it. Since this upgraded blog service provided by my web space supplier allows me to make some more changes and additions than the previous version, and allows me to put some things into the sidebar, I decided to see if I could add a feature that allowed readers to follow my blog. Of course, it’s always been possible to follow via the “Entries RSS” link to be found in the left hand sidebar which gave options of following via “Live Bookmarks”, “Google” and “My Yahoo”, but I decided to also add a button for following with Bloglovin as well. It’s part way down the panel on the left hand side. I know that some of my craft blogging friends use this service, so please do follow my blog with this service if you do use it. 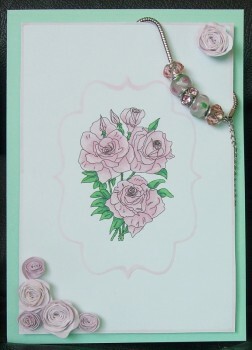 I’ve made a card, some jewellery, and some watch straps since my last post, so I hope you like my latest creations. 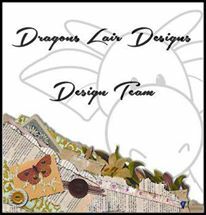 Facebook Users – If you like the digi stamp used on this card, and/or any other digi stamp I’ve used by Janette Padley, there is a group for all who like her stamps, called “Stamping Dragon Designs”, on Facebook. Please do come and join us – click Here! – and ask to join. 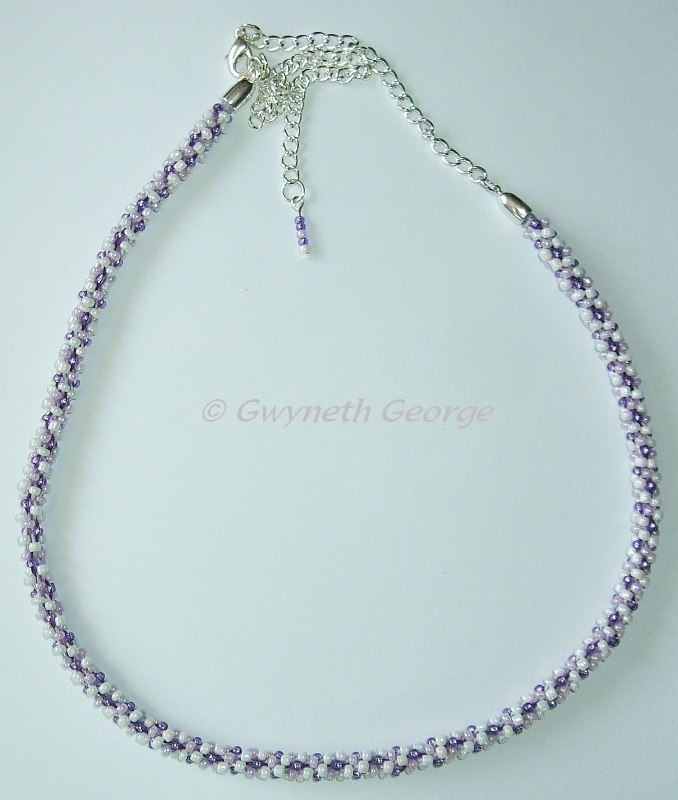 Kumihimo – In my post of the 23rd March I showed you the start of a beaded Kumihimo project I was working on. I showed you the beads and the start of the beading, as well as the start positioning of the various colours. I’ve now finished the piece and added small, 3mm, end caps, a chain and lobster claw clasp, wrapping thread round the unbeaded ends as I showed you for another project in the previous post before sticking on the cap with glue. 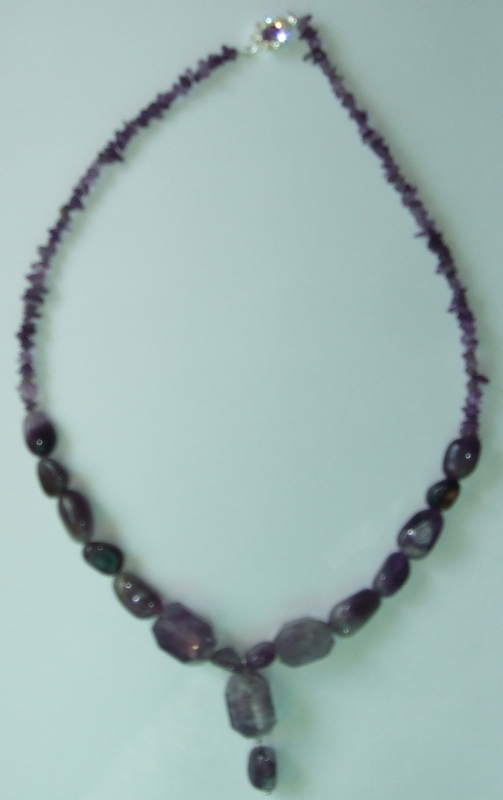 This is the finished beaded necklace. This is the end stuck into an end cap. 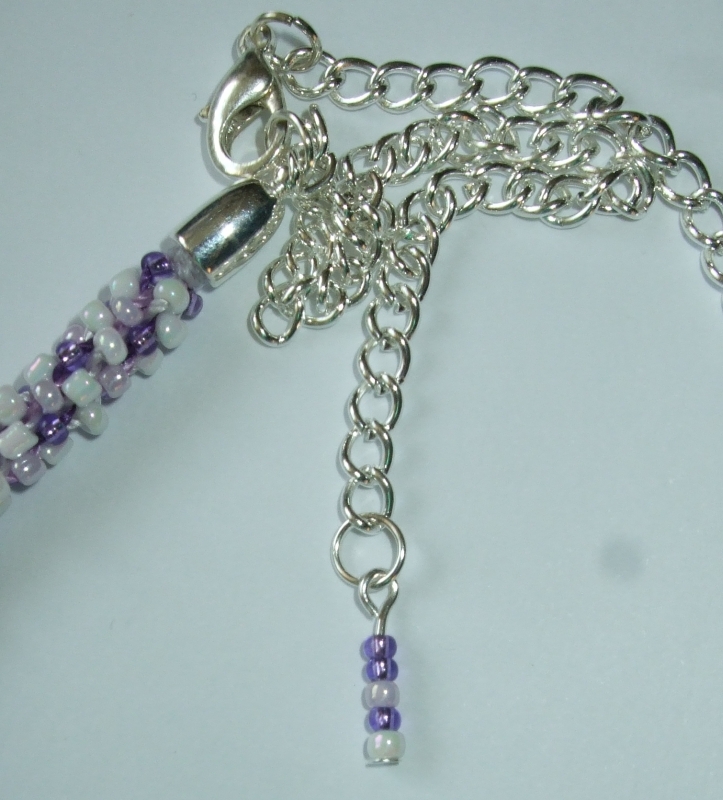 I added a few of the beads to a head pin as a charm at the end of the piece of chain – the clasp can be clipped any place along the chain so that it can be worn at a length to suit the wearer. 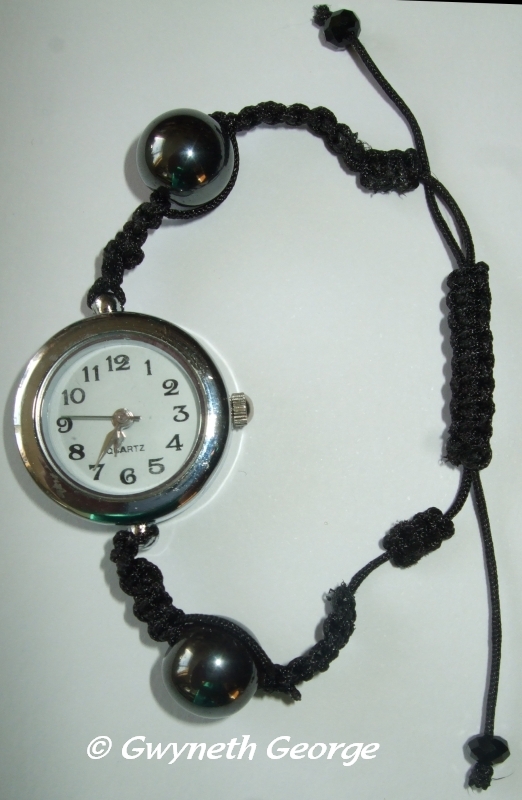 Watch Straps – Having seen my watch with a Shamballa bracelet style strap (the blue one I showed you in my post of the 10th January), and the shamballa style bracelet with black hematite beads that I showed you in my post of the 30th November, my two youngest nephews decided that I should make them some as well. Well in fact, one of them keeps on going to my watch and the bracelet and trying them on – just to see if his arm and hand had grown enough so that they wouldn’t fall off him! In the end I told them that I’d get some watch faces and that they could help me make them a watch each to keep as Sunday Best to ware to Sunday School, etc. 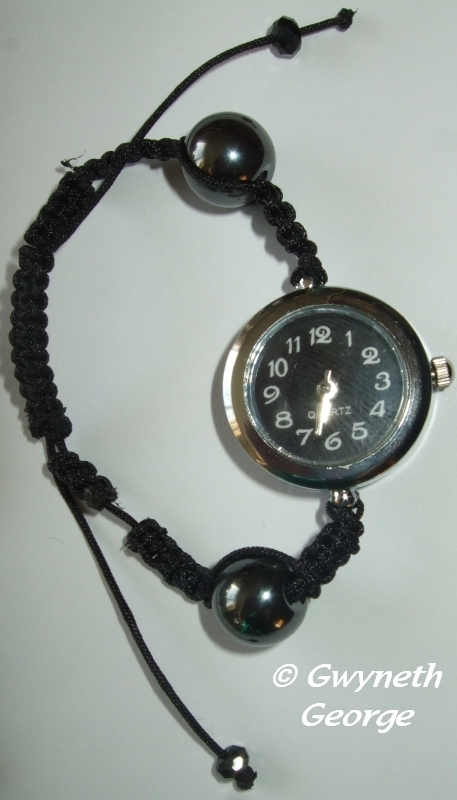 The first version we made had magnetic clasps, as these are something the boys can use themselves, but they decided to fiddle with these, so we’ve now changed the strap to have the traditional Shamballa style knotted slider clasp. These are the results. and the other with black writing on a white face. 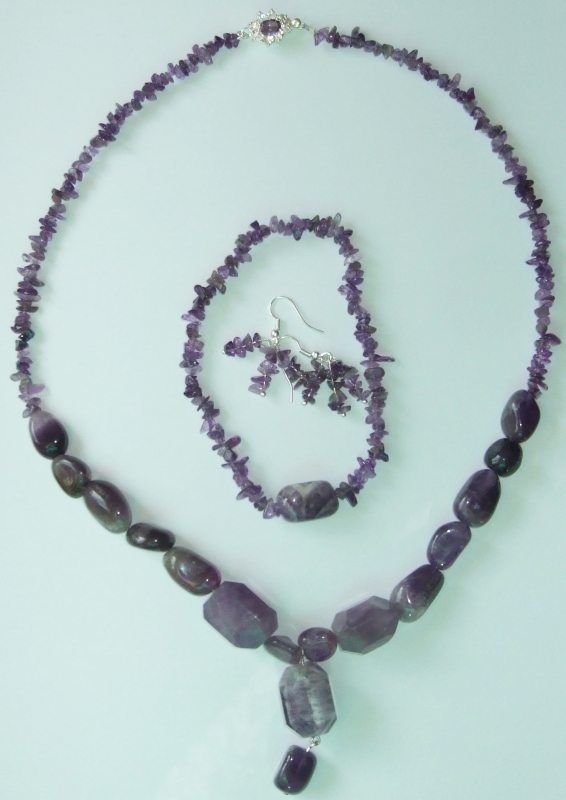 Amethyst Jewellery – This is a “For Me!” set made with semi-precious stones. 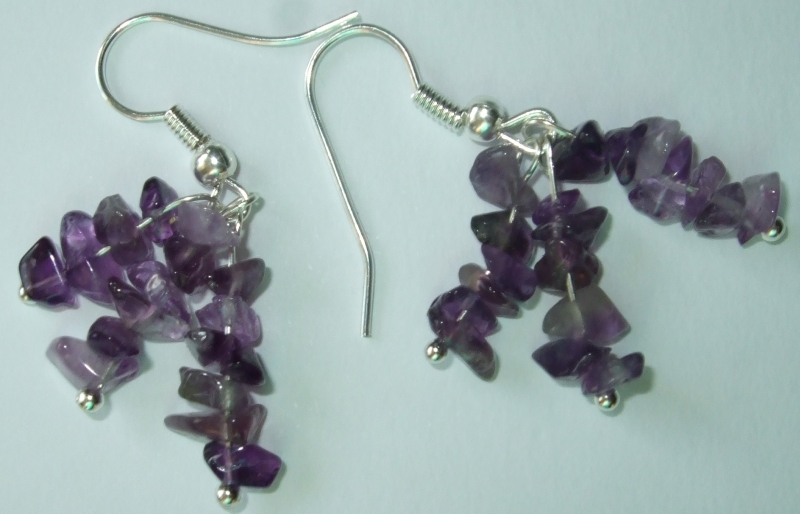 To make them I’ve used: Small Amethyst Chips 3-5mm, Amethyst Long Drilled Nuggets 10×14-13x18mm, Amethyst Faceted Nuggets 15x20mm, and Clasp silver-plated oval amethyst & rhinestone sparkle, together with some tiger tail wire, stretch jewellery elastic and some findings in silver tone. 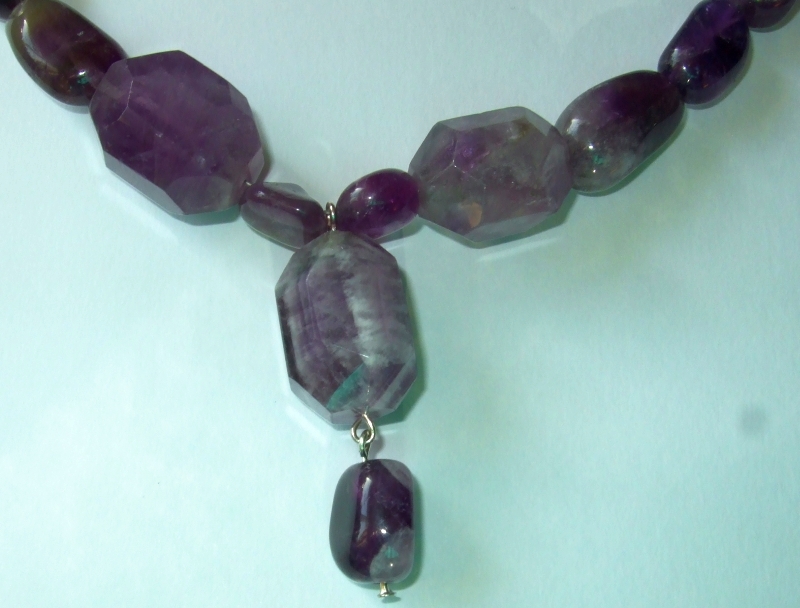 This is the necklace made using some of each of the three sized amethyst beads I’d bought. 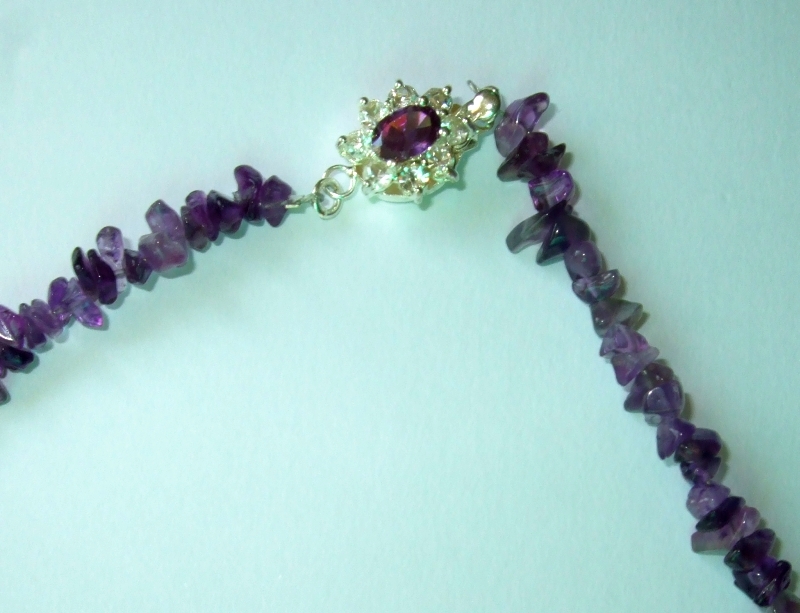 The necklace was made on tiger-tail wire with the fancy clasp added. 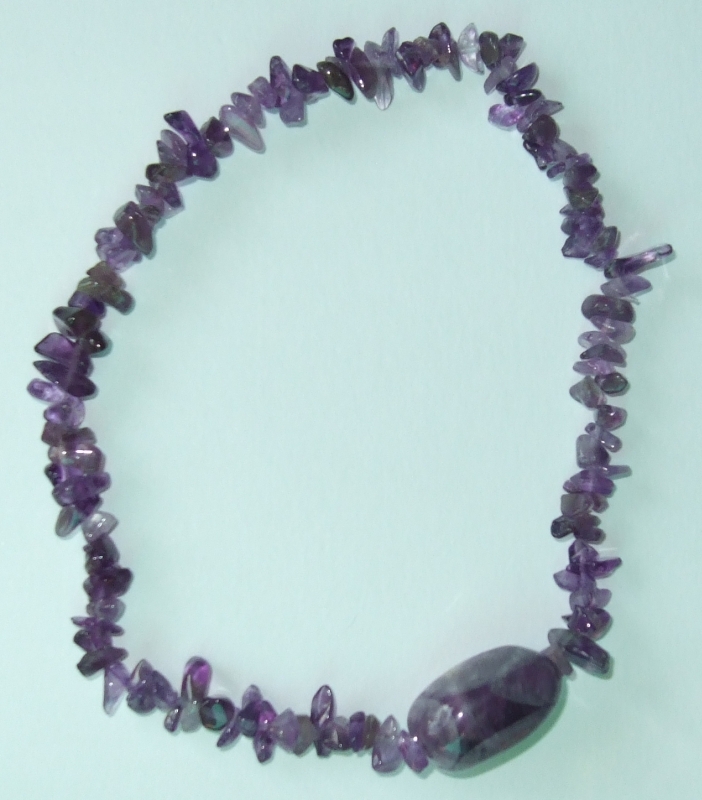 The bracelet is made using the chips and one long drilled nugget on a stretch elastic cord. Three drops of chips on small head pins make up the earrings. This is what the set looks like together. Friday, 12th – Here! – “FREE CD Vol 41, New From Janic McFarlane & CUP News” is how the content of this mailer is described. Monday, 15th – Here! 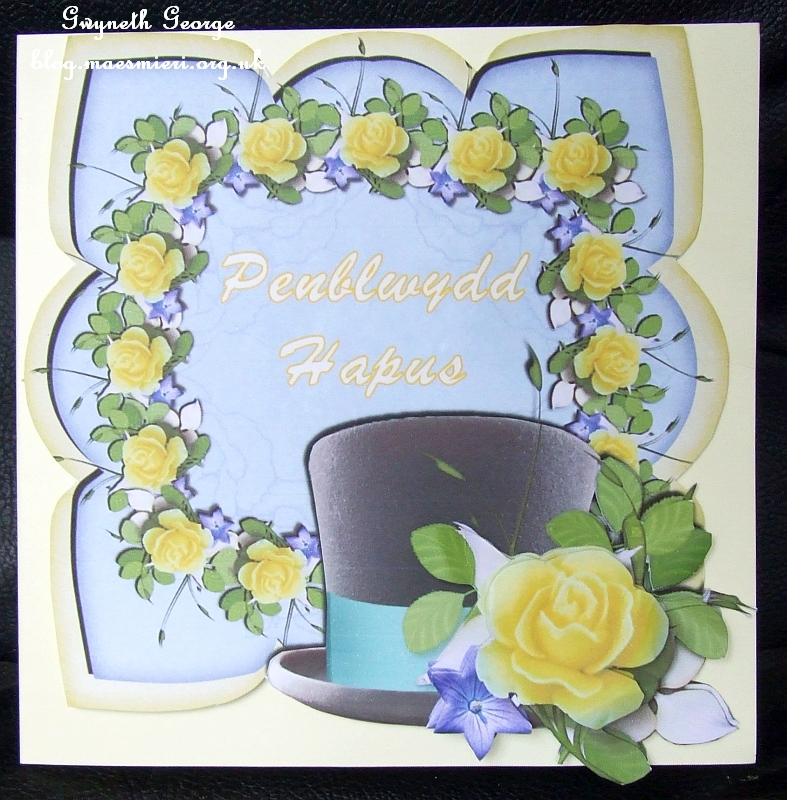 – This mailer is full of designs being showcased and bits of news – “NEW Double Panel Top Slot Kits, NEW Bottle Bags, Silver Designers, FREE CD & Cup News”. Wednesday, 17th – Here! 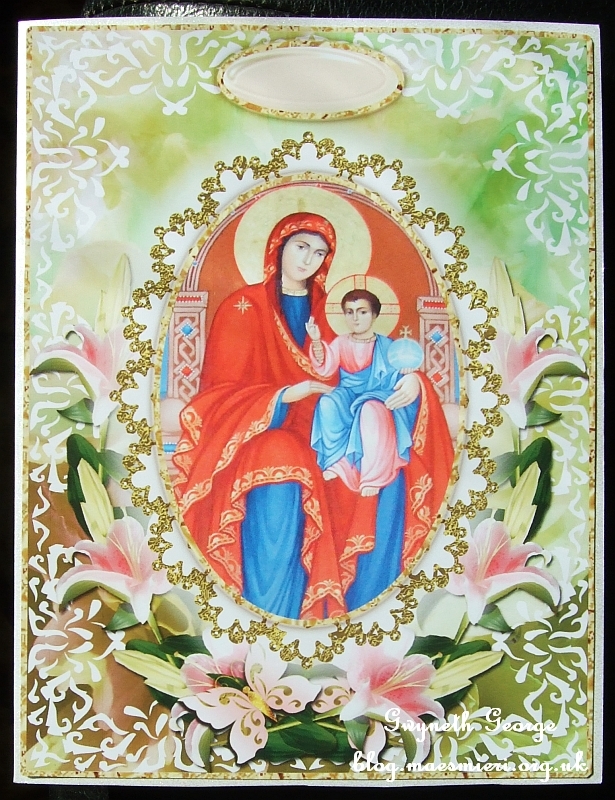 – Babies, cars, dogs, flowers, fairies – are just some of the things on cards being showcased in this mailer which has the subject line “FREE CD, Back Issues CD SALE, Silver Sellers, New From & News”. 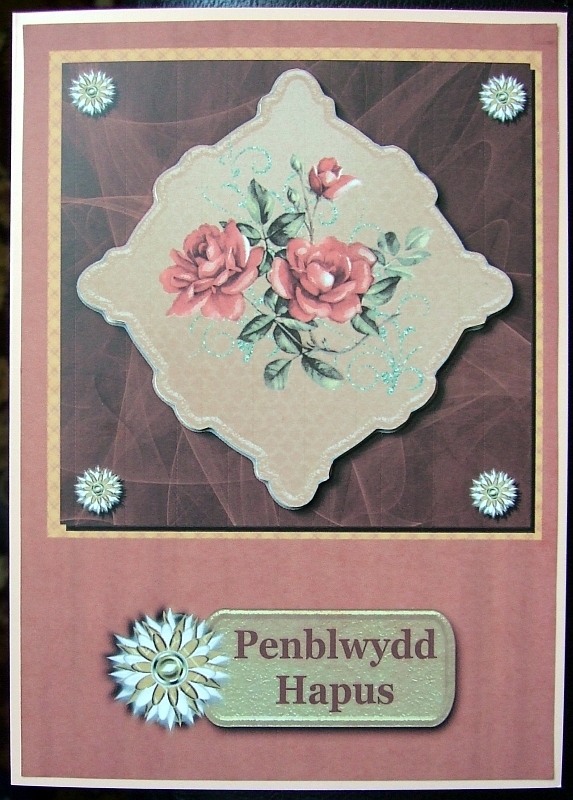 You can see the cards I’ve made using design sheets from CUP in my Crafter Showcase Area on Craftsuprint.com – Here! and also to everybody who’s left comments on my previous blog posts. Just a quick blog post this time. 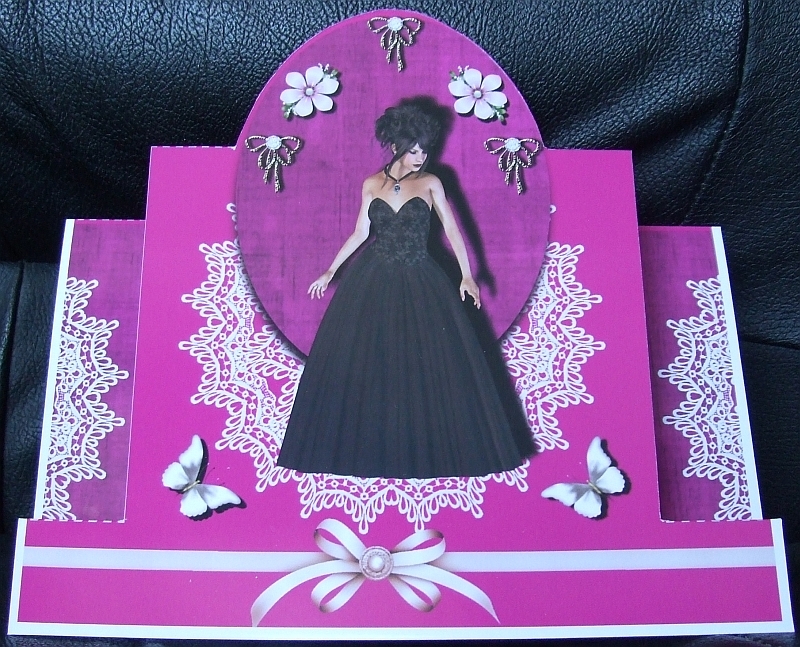 It’s a card with a bracelet draped over a corner as an embellishment. 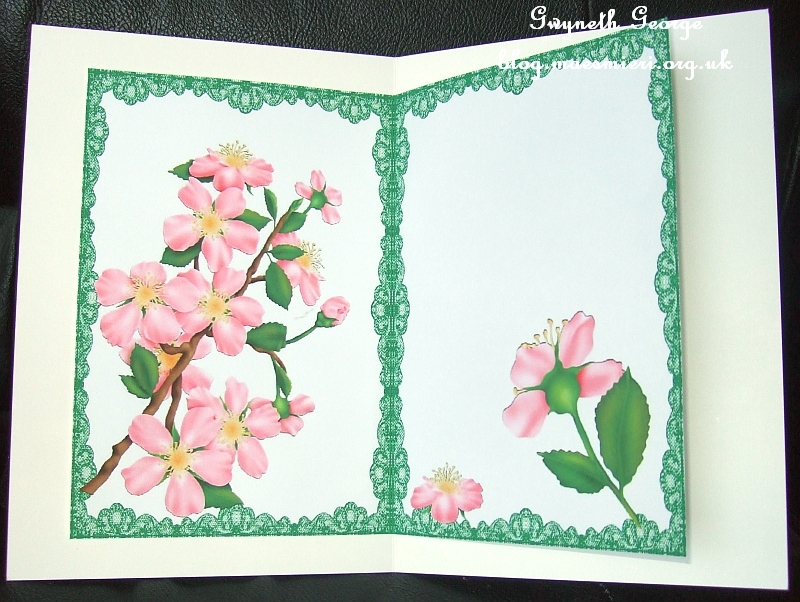 Because of the soft, subtle colour of the lightest pink used the picture isn’t quite as good as the real thing, and it doesn’t show the embossed panel area that’s slightly raised. 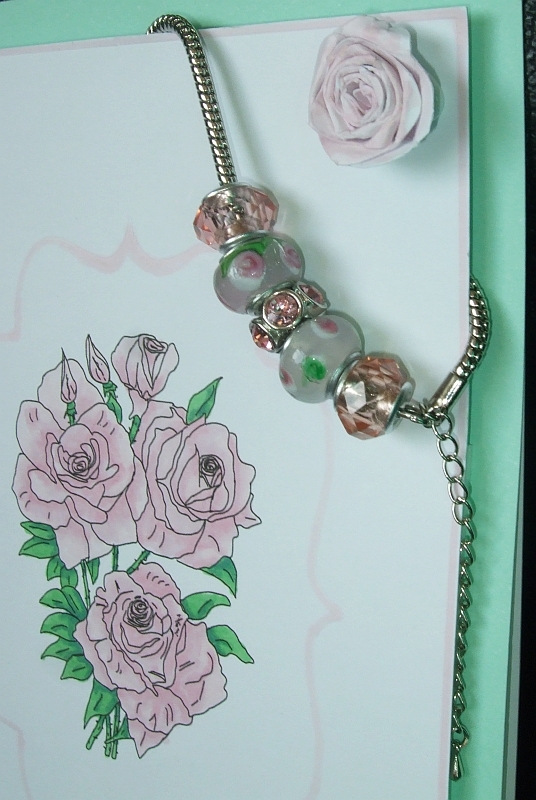 The bracelet I’ve added as decoration, and as a gift to go with the card, was simply made using a Mix and Mingle bracelet chain and beads. 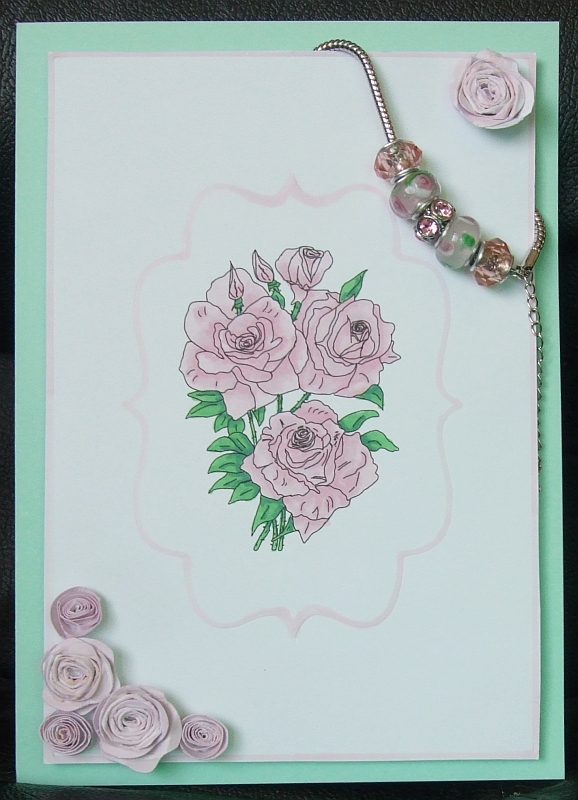 The pinks with the slight bit of green on two of the beads, match the colours I’ve used on my digi and paper roses. 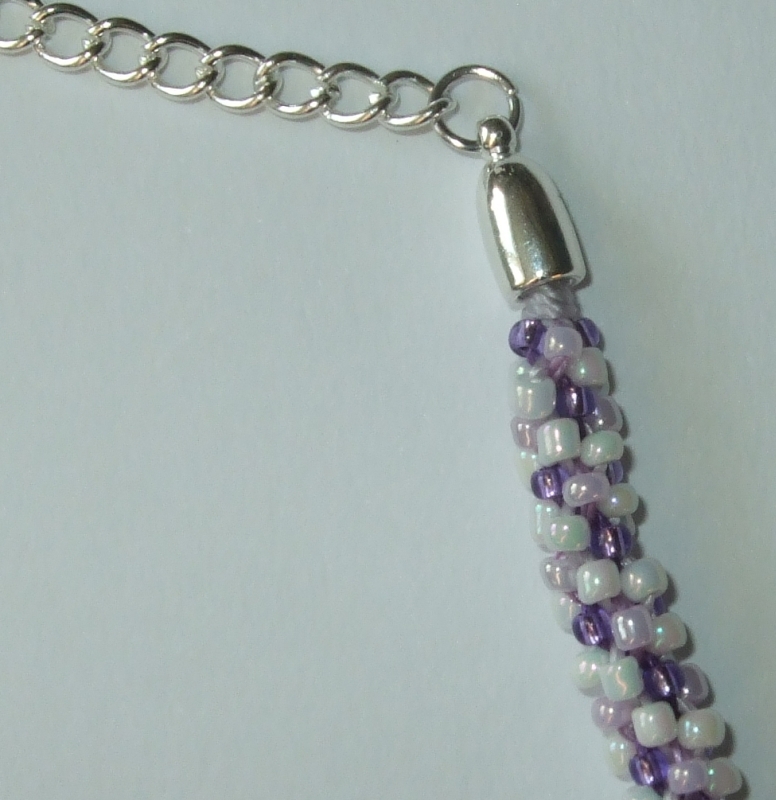 The bracelet was simply a case of choosing which beads I wanted and threading them onto the chain. To get the bracelet off the card it’s simply a case of unclasping the clasp and pulling the chain out the top. 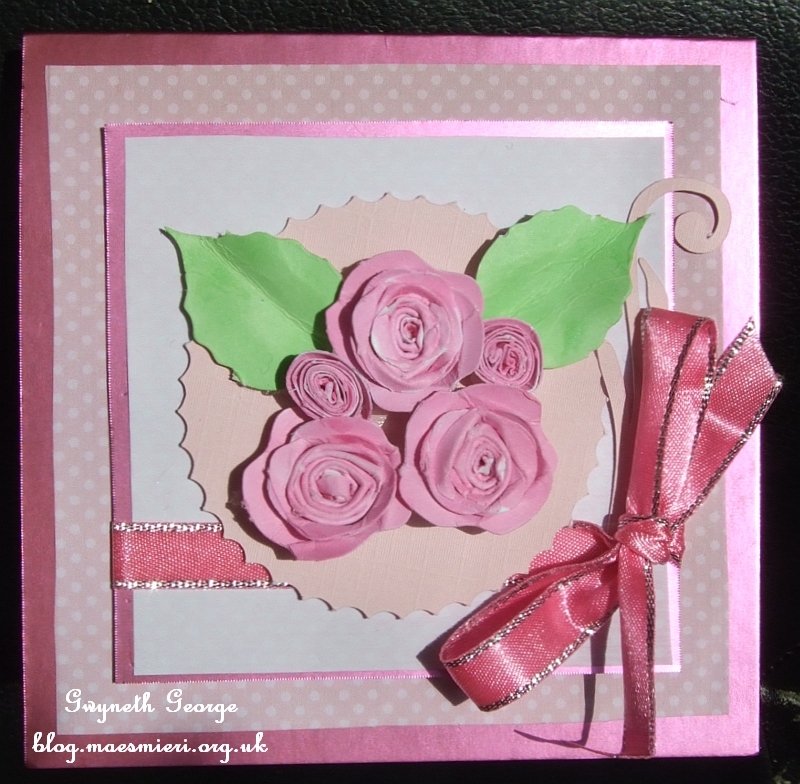 By making my own paper flowers in a couple of different sizes, and colouring them in using the same ProMarker, Pink Mittens, I’d used as one of the pinks on the card itself, I was sure that the embellishment would work with the card. 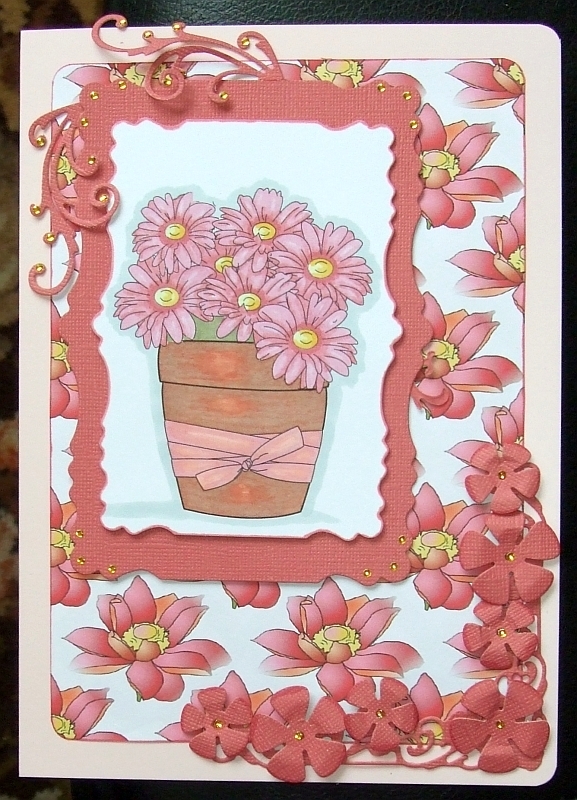 I used die cut spirals and colored them before making the flowers. 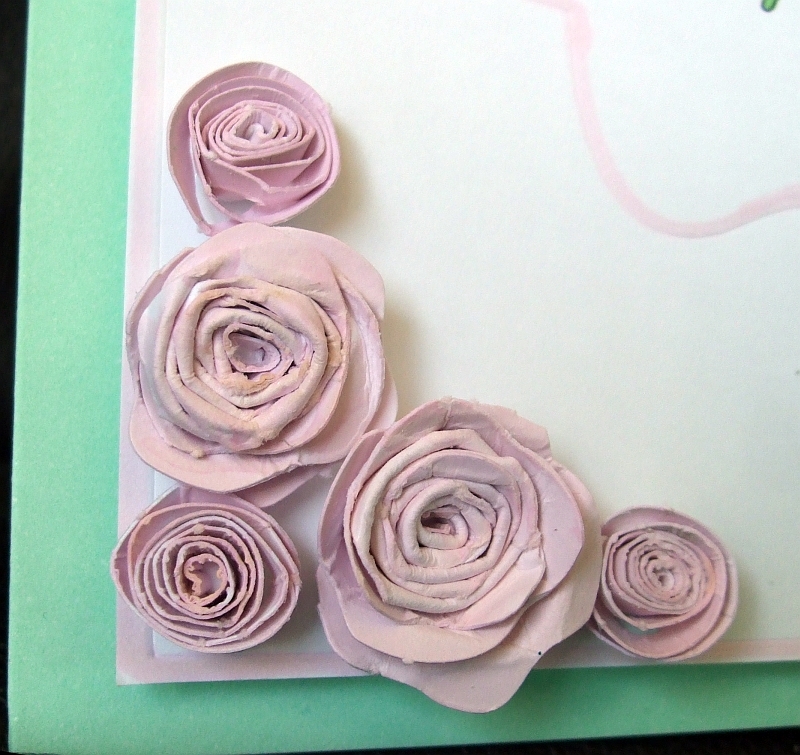 The technique I used was similar to the one in part 2 “Paper Roses From Spirals” of my Making Paper Flowers page. 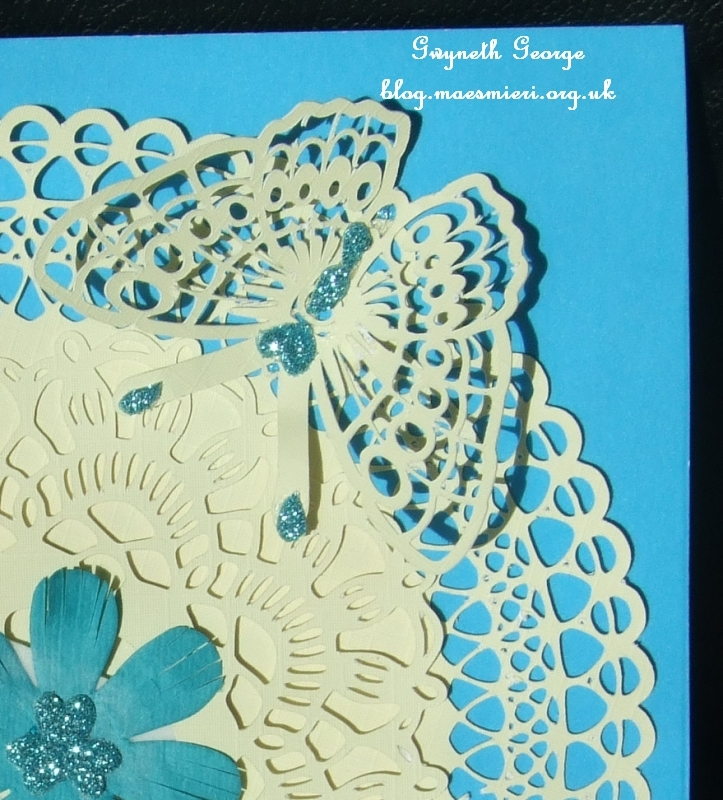 I’ve made cards before with a box attached to hold a gift of jewellery, but this is the first time I remember actually putting the jewellery onto the card front as part of the design. General life things have got in the way of crafting a bit over the last week or so, but I finally managed to get a batch of cards I’d been slowly working on – printing, cutting, choosing cardstock, etc., – completed yesterday, although I had such a headache in the afternoon and evening I had to give up on writing this blog post. But I’m feeling a bit better today so thought I’d better get everything written up or I’d have forgotten what I did and what I used. 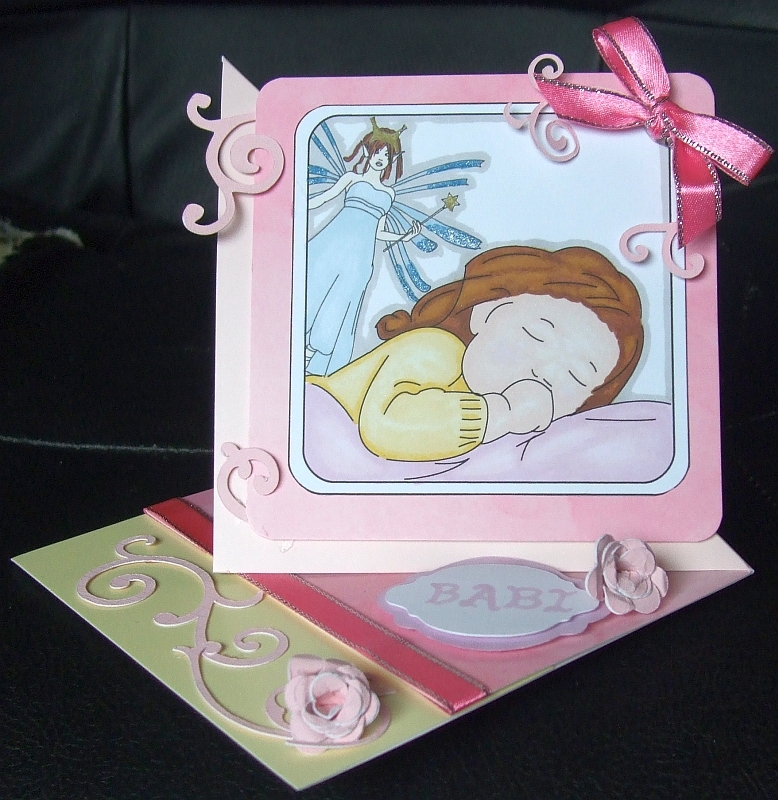 I hope you like the assortment I’ve got, which cover cards from little baby girl through to a grandfather. 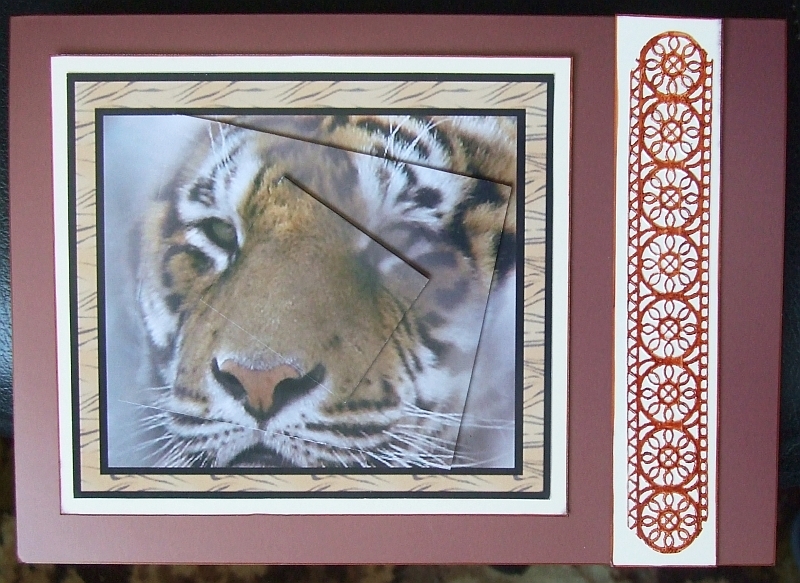 An angled view of the above card to show dimension. 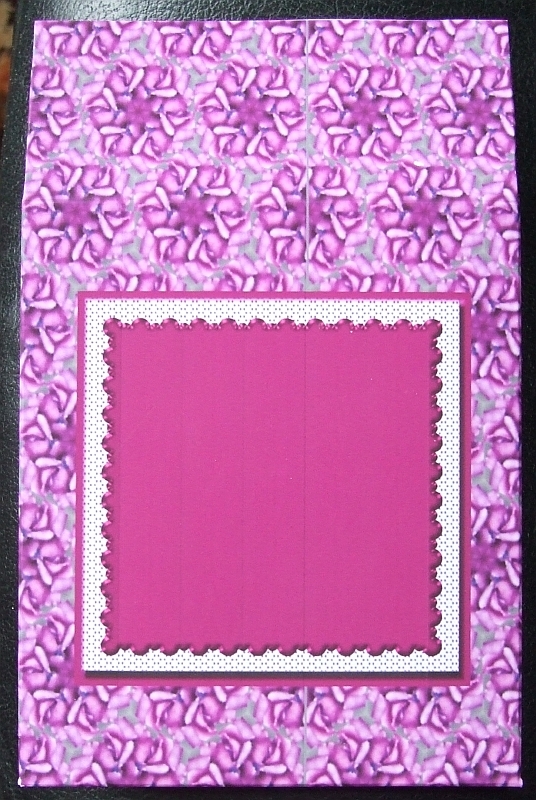 An angled view of the card to show the dimension. 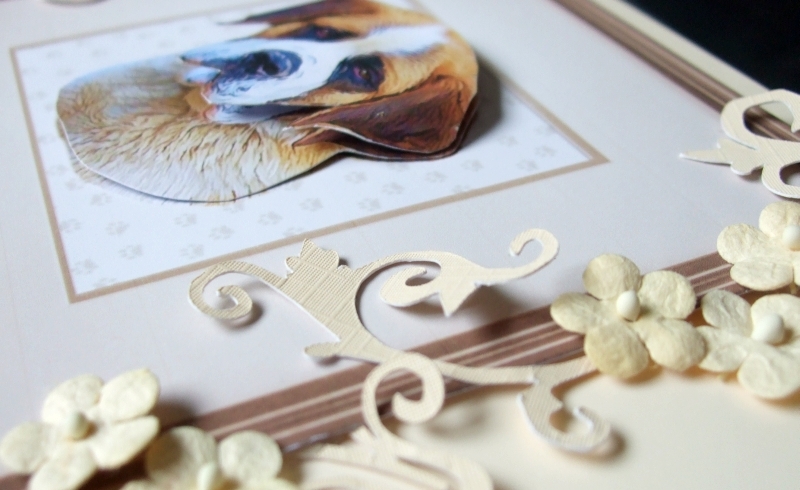 An angled view to try and show the dimension of the decoupage on the dog’s head. Quite a simple bag design this time, made using one sheet of A4. Side view of the dimension of the bag. I’ve knitted over half the shoulder wrap I showed you the start of in my post of the 27th March, so keep an eye out in future posts for further pictures of my progress and the finished item. 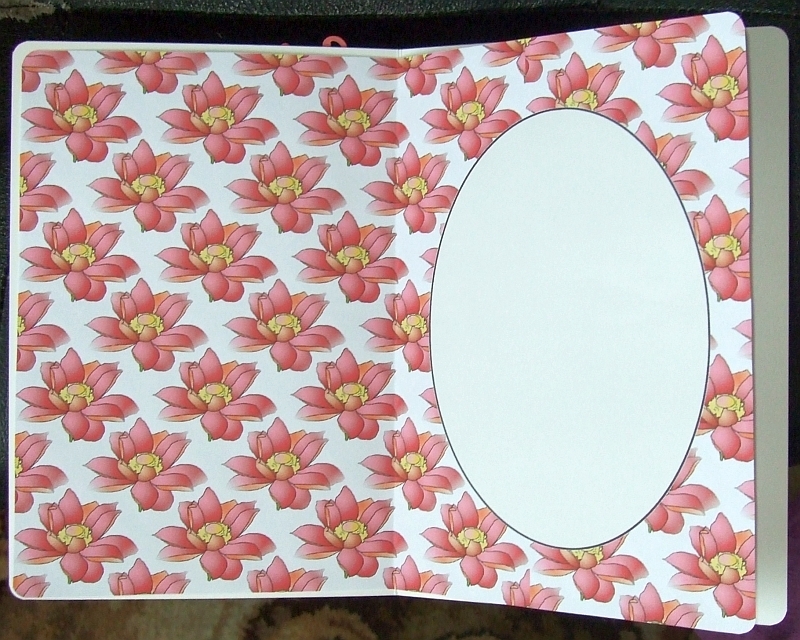 The Colouring In Digi Stamps page had grown to such an extent I decided to split the information onto several pages. So you’ll now find the main page has a list of the topics I’ve been writing about with links to the sub-page the information is now on. 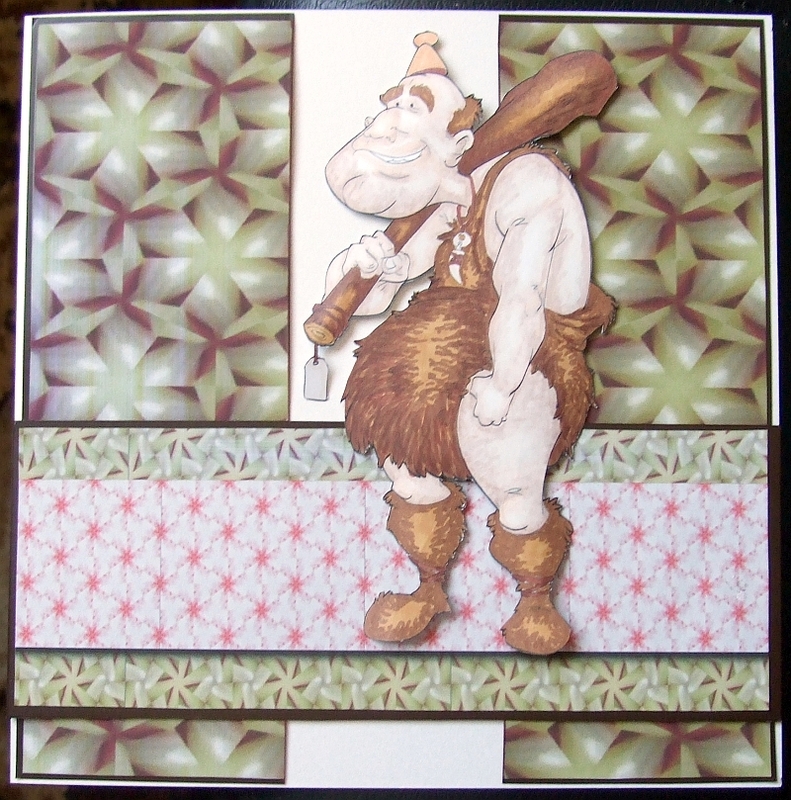 The information I’ve added lately is about the ProMarker Colour-Blend Sets. 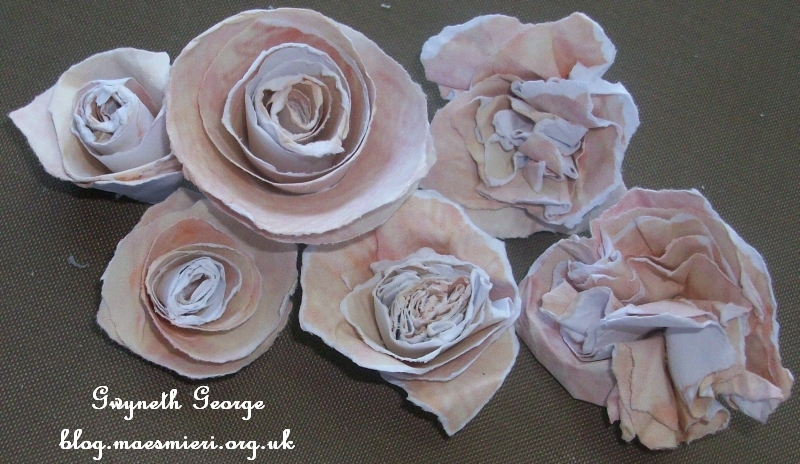 I’ve not made any additions to my Making Paper Flowers page since my last blog post. 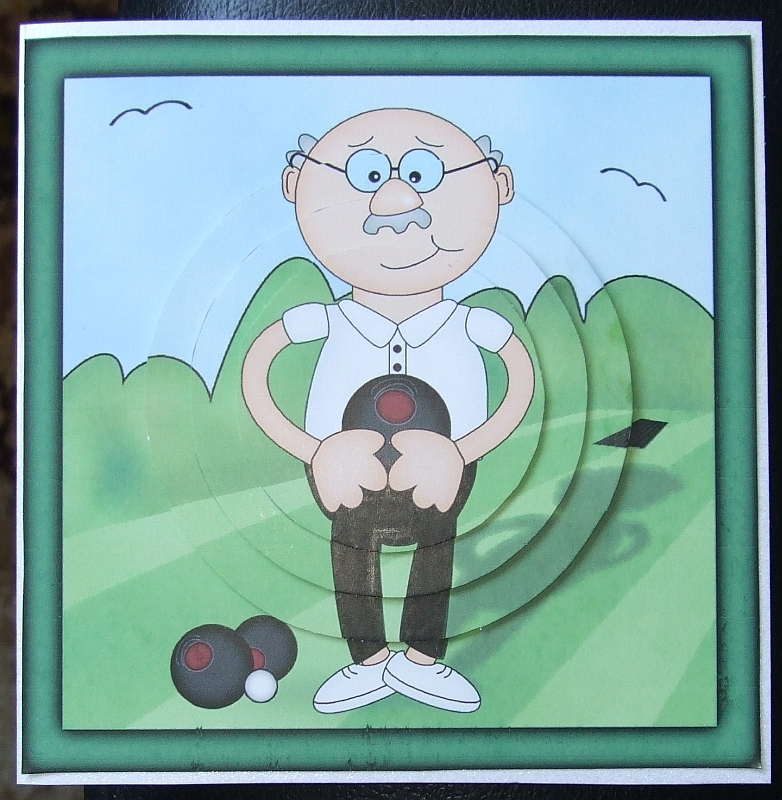 There are now over 190 digital shops active on craftybob.com selling all sort of craft related products from finished, hand crafted, items, to consumables that crafters might want to use. 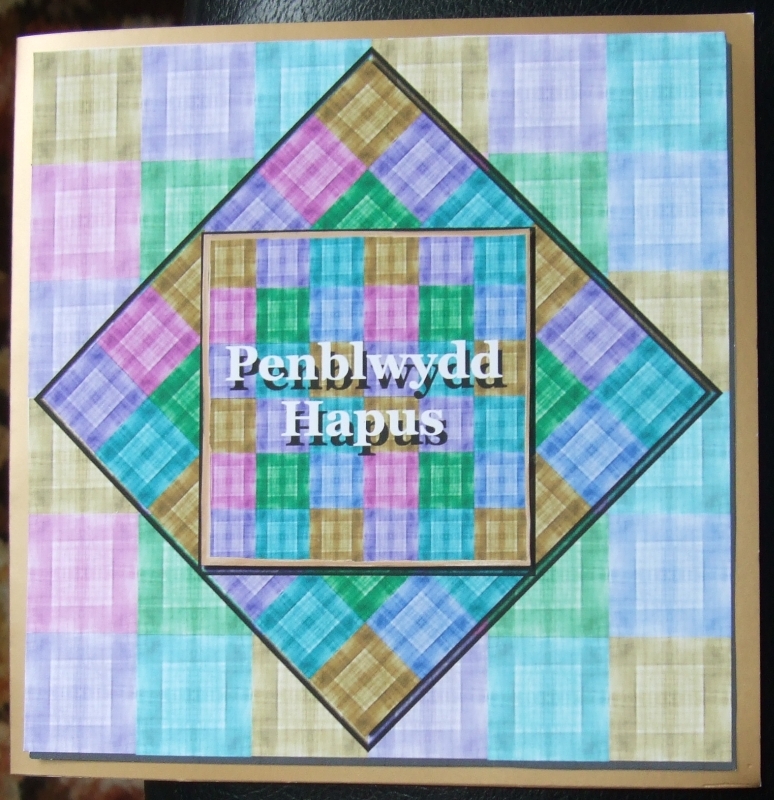 Have a look – here – at my whole shop ”Siop Crafftau MAES MIERI Crafts Shop” on craftybob.com. Friday, 5th April – Here! – This time it’s “NEW FREE CD Vol 40, New From Sheila Rodgers & CUP News”. 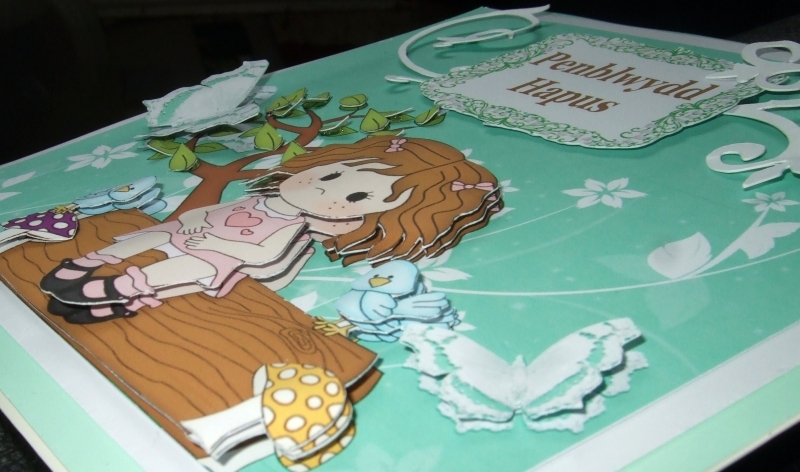 Remember that you only need to spend £10 on craftsUprint to have the free CD-ROM and added crafting goodies sent out to you for free, with no postage charge either. Monday, 8th April – Here! – Click to find details of “FREE CD, New From Lynne Crosskill & Elite and Titanium Designers”. Wednesday, 10th April – Here! – This mailer includes “New From Carol Clarke, FREE CD, Sue Way Spotlight & News”. There was a Card Swap on the “Stamping Dragon Designs” group on Facebook in March and I decided to join in. 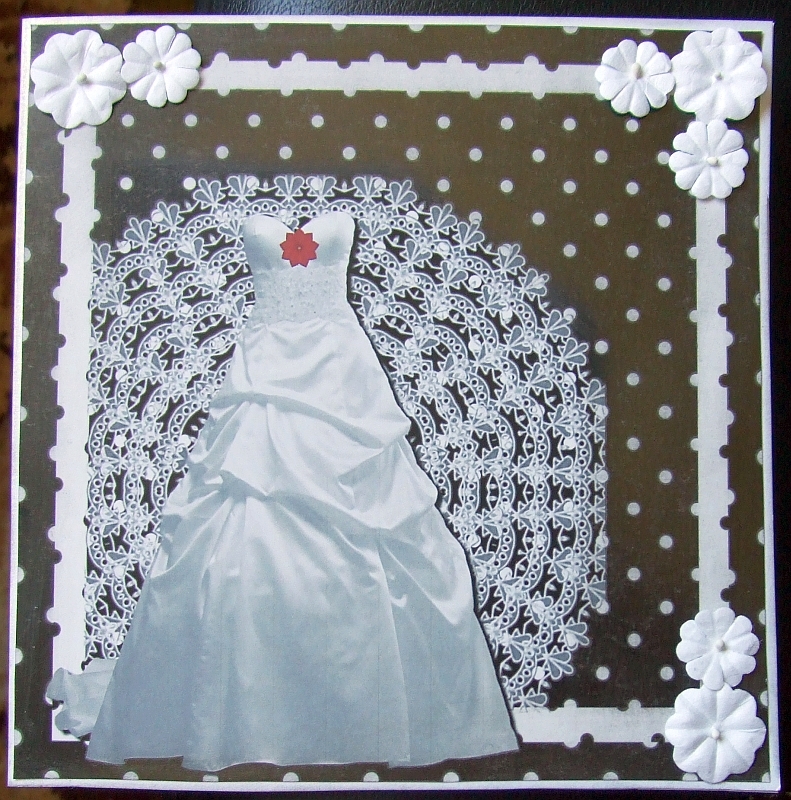 I was partnered with Kim Brown from Kentucky in the USA. 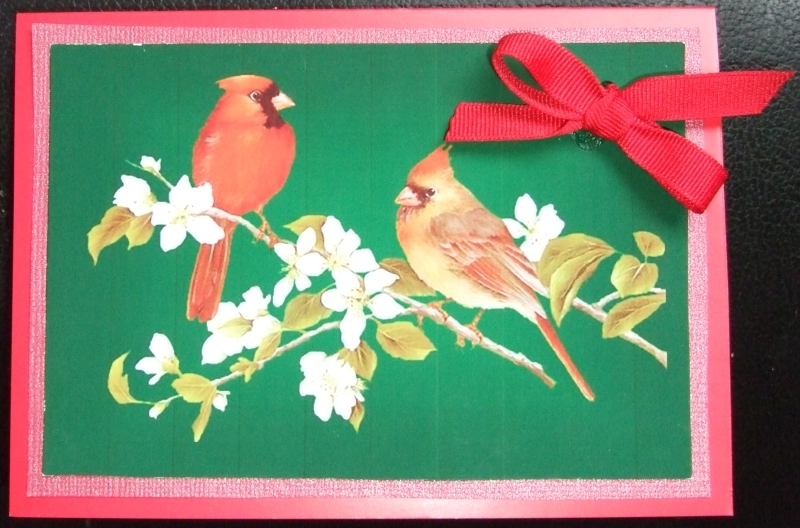 This is the card I received from Kim. It arrived in the post yesterday. It all folds up on itself and then opens out to this. 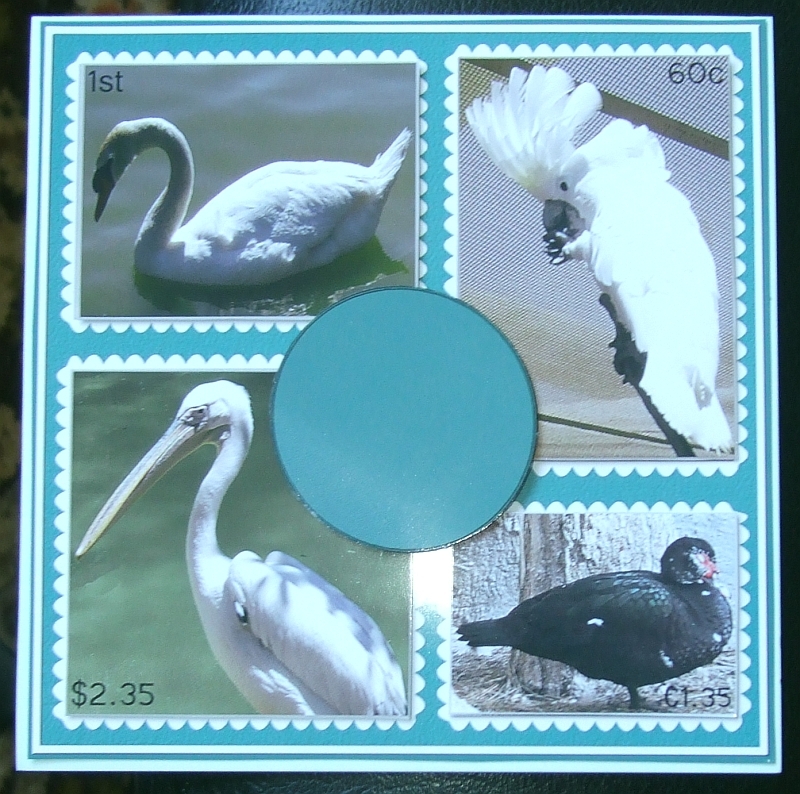 The second and third photos are closer looks at the two sentiment tags on the card. 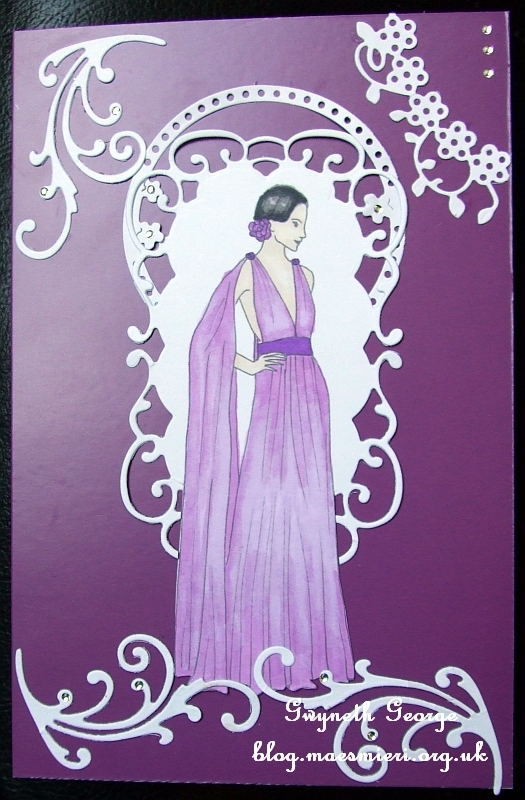 It’s a really lovely card. Thank you so much Kim! 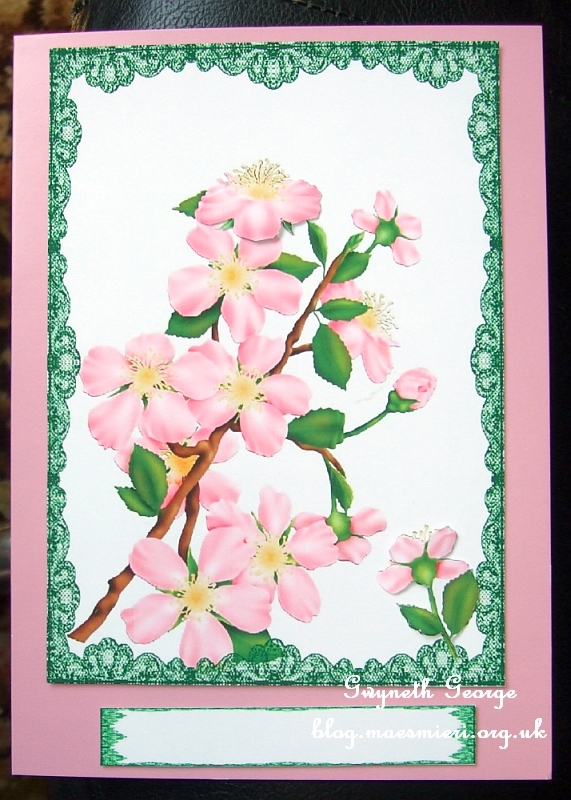 This is the card I sent Kim. And it arrived with her this week as well. 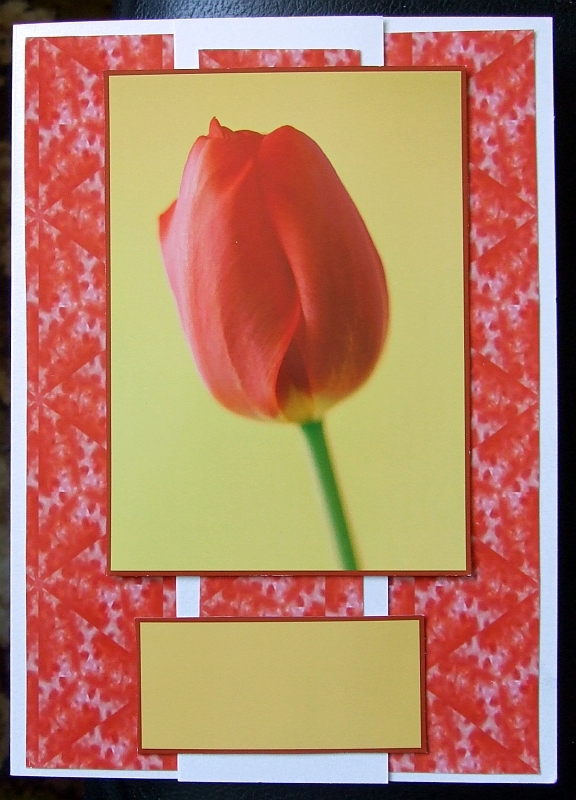 Red floral insert 1 by Stephen Poore (I printed off an insert that matched the backing paper design I’d used and stuck this inside the card using finger-lift tape as well). Wednesday, 3rd April – Here! – The subject line of this mailer is – “New From Sue Douglas, Free CD, Platinum Sellers & Cup News” – so lots to look at and read again in this one. My young nephews have, very kindly, shared their cold with me and the rest of the family – it’s just unfortunate that what gives them a cough, and makes them feel a bit ill, knocks me and my parents quite badly. So I’ve spent Easter Weekend coughing and spluttering and sneezing and feeling rather rough. Today I decided to try and take my mind off it by finishing putting together some cards I started working on days ago. Haven’t managed to make up all the cards, in fact I don’t think I’ve made half of the ones I’ve got cut out made up, and I’m not feeling any better or worse, and I have very little voice at the moment (not a good thing when other members of the household don’t hear very well at the best of times, and also are bunged up with a cold at the moment so we’ve got a serious communication problem until either my voice returns or their ears get better enough for them to stick their hearing aids back in). In any case – I decided that, as it had been some days since I did a blog post, I should take some time this evening to do a quick post with the few cards I did manage to put together. I hope you like them. 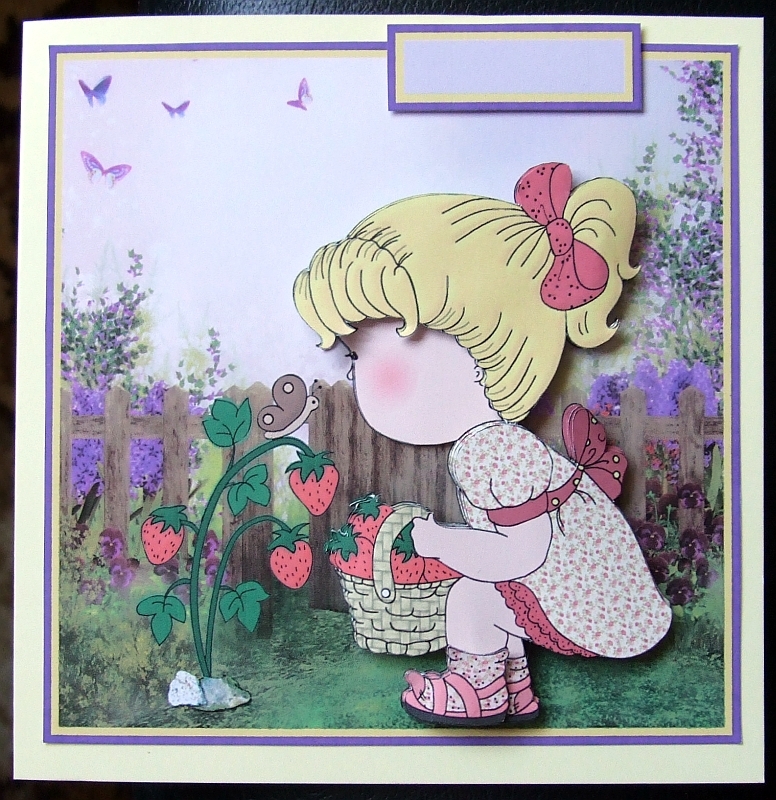 I hope I’ll be back before long with some more cards, especially some using items I’d cut with my Cameo and digi-stamps I’ve already coloured in. Friday, 29th March – Here! 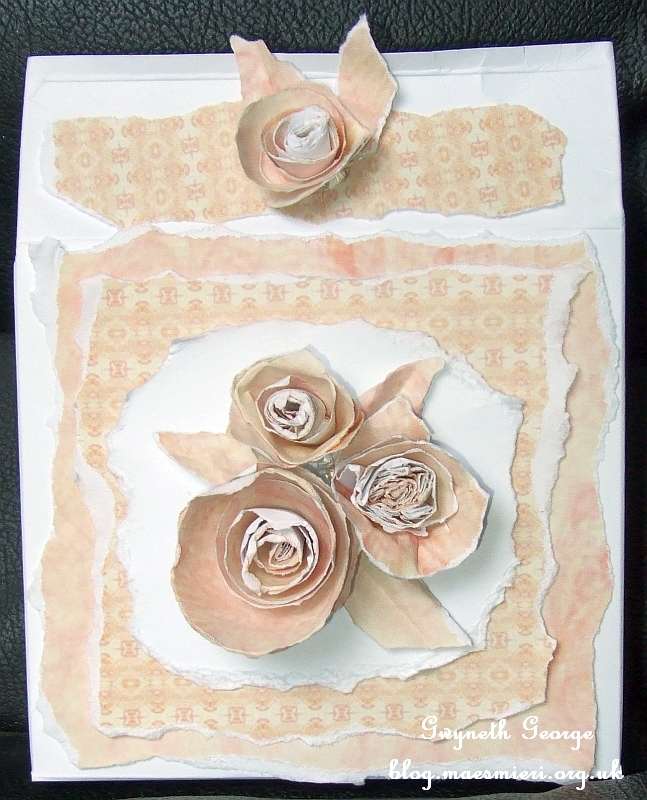 – It’s “Vol 39 FREE CD, NEW Sandie Burchell Concept, Special Offer Paper & CUP News” this time. Monday, 1st April – Here! – This mailer contains items such as “Free CD, New From Dawn Hill, Platinum Sellers & CUP News”, so please click over for a look.